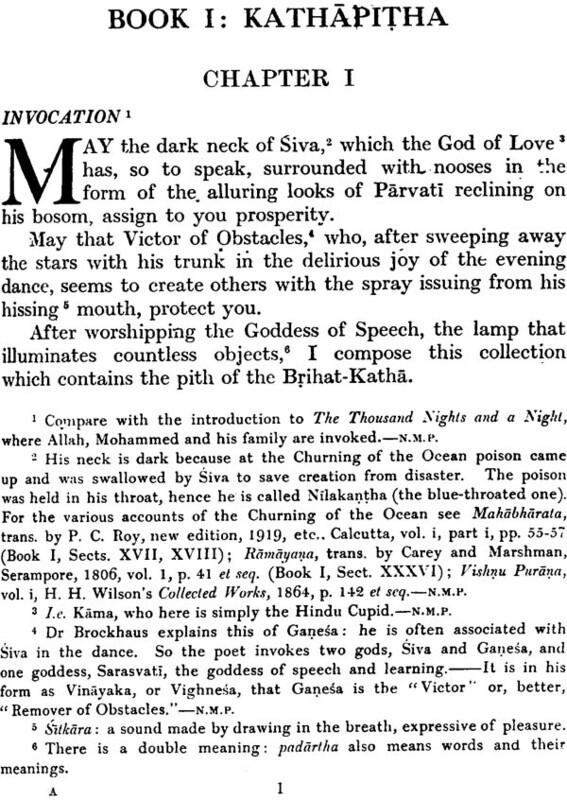 The book The Ocean of Story of Somadeva's Katha Sarit Sagara (or the Ocean of Streams of Story) was translated by Charles Henry Tawney and is the earliest collection of stories extant in the world. This edition was edited by N. M. Penzer. The whole work is presented in 18 parts of 10 volumes and contains 22, 000 slokas, which gives some idea of its immense size. It is nearly twice as big as the Iliad and Odyssey put together. 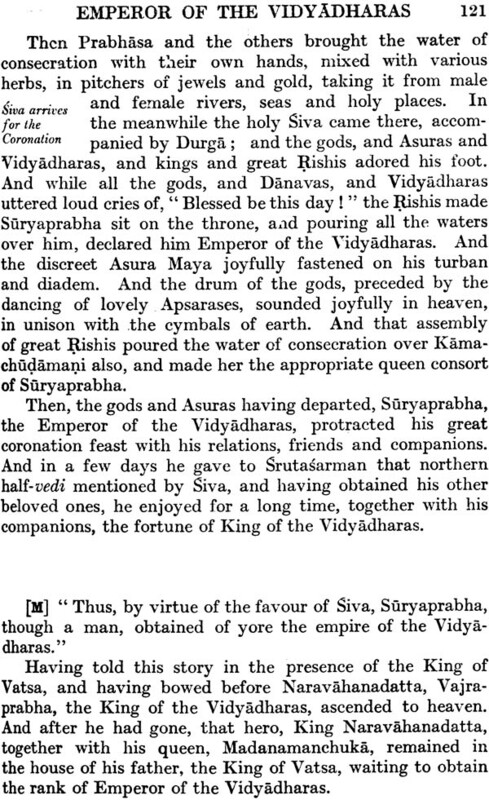 The Ocean of Story is an attempt to present as a single whole the essence of that rich Indian imagination which had found expression in a literature and art stretching back to the days of the intermingling of the Aryan and Dravidian stocks nearly tow thousand years before the Christian era. At the end of each volume, there are two indices. 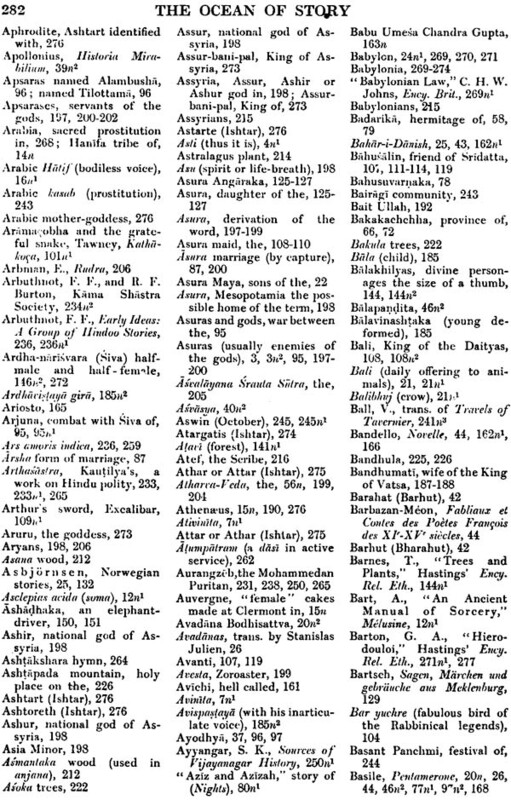 The first contains all Sanskrit words and names, also proper names of people, towns, etc., in any language. 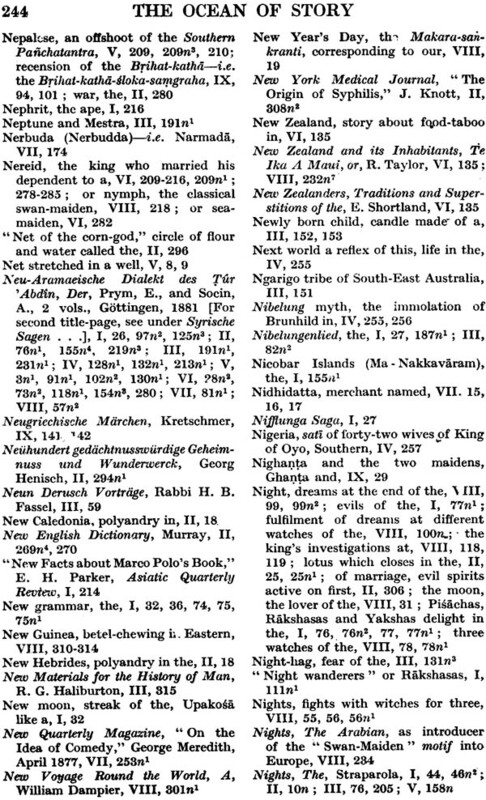 The second is the General Index. Appropriate Appendices. Are also given. 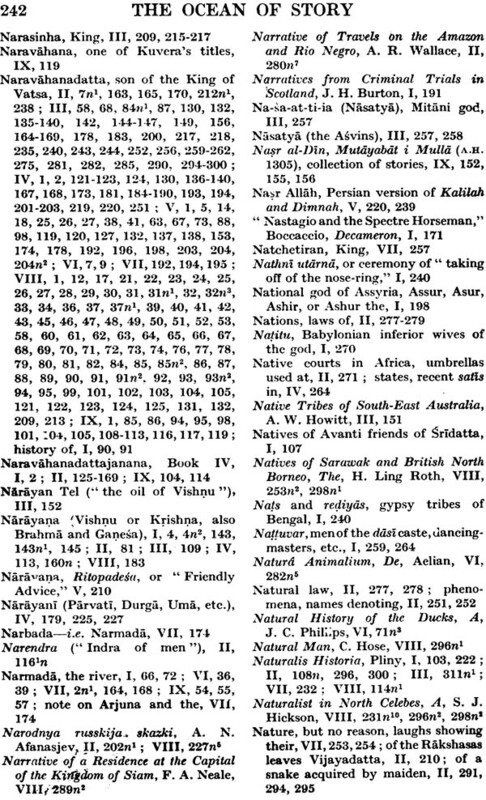 The Ocean of Story, or to give it its full Sanskrit title, the Katha Sarit Sagara, is, for its size, the earliest collection of stories extant in the world. 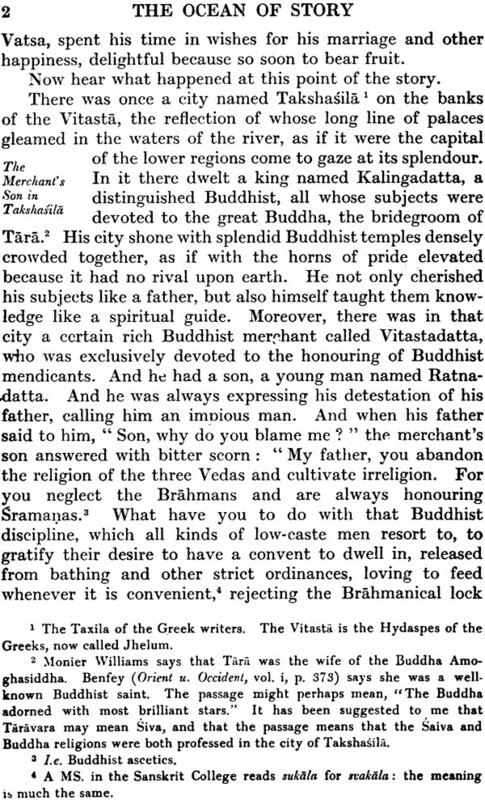 Its author, or rather its compiler, was a Brahman named Somadeva. Unfortunately we know nothing of him, except what he himself has told us in the short poem at the end of his work, and what we may gather of his ideas and religious beliefs from the work itself. In the first place let us look at the title he has chosen for his collection. He felt that his great work united in itself all stories, as the ocean does all rivers. Every stream of myth and mystery flowing down from the snowy heights of sacred Himalaya would sooner or later reach the ocean, other streams from other mountains would do likewise, till at last fancy would create an ocean full of stories of every conceivable description-tales of wondrous maidens and their fearless lovers, of kings and cities, of statecraft and intrigue, of magic and spells, of treachery, trickery, murder and war, tales of blood-sucking vampires, devils, goblins and ghouls, stories of animals in fact and fable, and stories too of beggars, ascetics, drunkards, gamblers, prostitutes and bawds. This is the Ocean of Story; this the mirror of Indian imagination that Somadeva has left as a legacy to posterity. 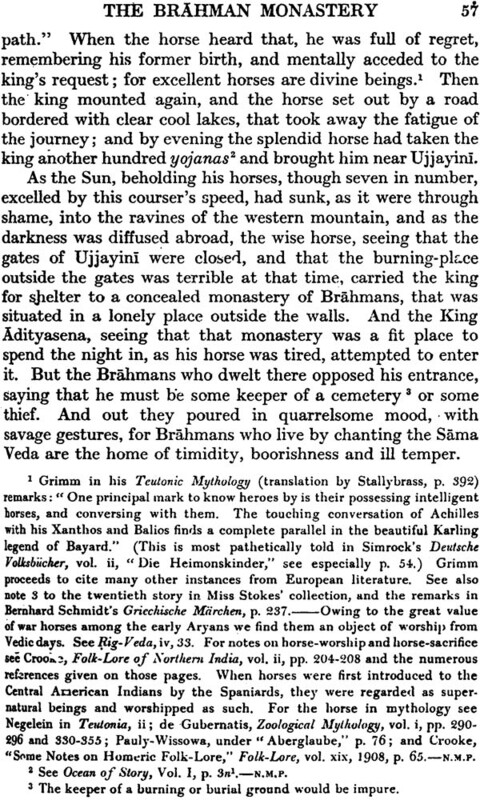 Following out his metaphor he has divided the work into one hundred and twenty-four chapters, called tarangas-"waves" or "billows"-while a further (and independent) division into eighteen lambakas- "surges" or "swells"-was made by Brockhaus, whose text is that used by Tawney. The whole work contains 22, 000 distichs, or slokas, which gives some idea of its immense size. It is nearly twice as long as the Iliad and Odyssey put together. 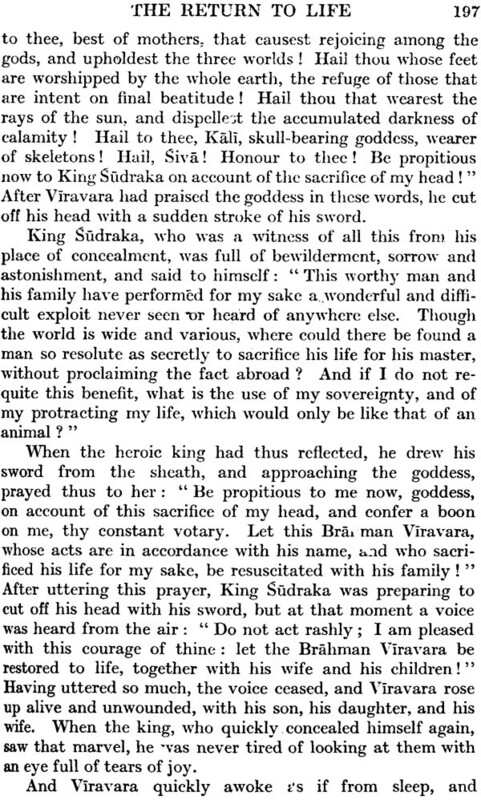 The short poem of Somadeva already referred to was not included by Brockhaus in his text, but was printed later from MS. Material by Buhler. 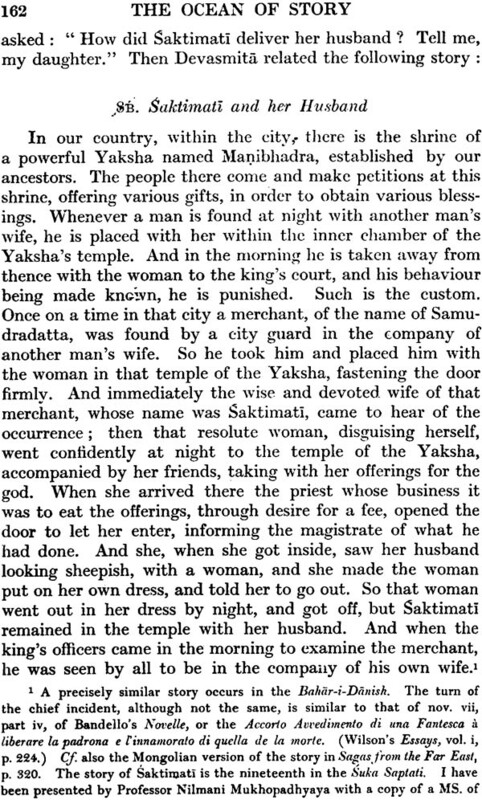 From this it appears that the name of our author was Soma-i.e. Somadeva. He was the son of a virtuous Brahman named Rama. 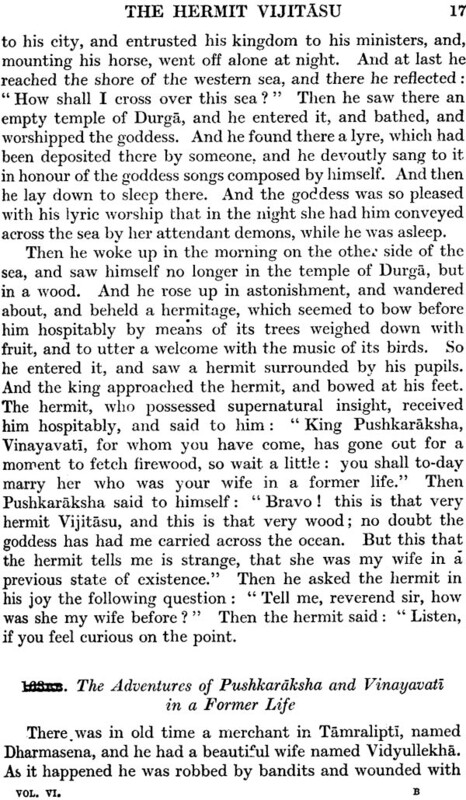 His magnu opus was written for the amusement of Suryavati, wife of King Ananta of Kashmir, at whose court Somadeva was poet. The history of Kashmir at this period is one of discontent, intrigue, bloodshed and despair. 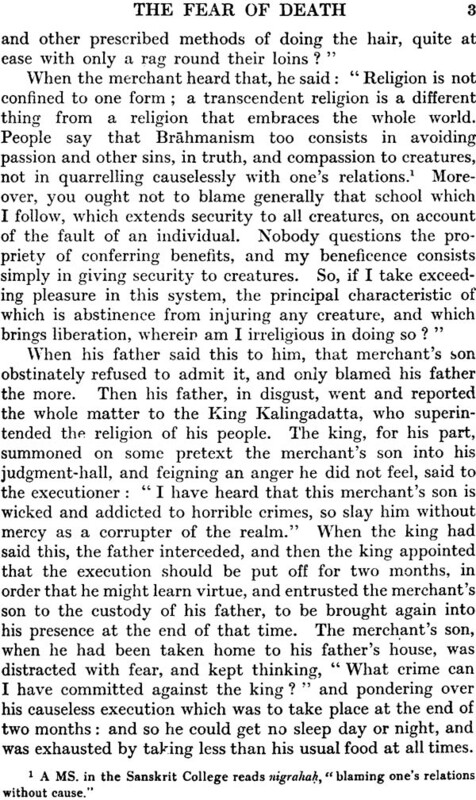 The story of Ananta's two sons, Kalasa and Harsha-the worthless degenerate life of the former, the brilliant but ruthless life of the latter, the suicide of Ananta himself and resulting chaos-is all to be read in the Raja-tarangini, or Chronicle of the Kings of Kashmir. 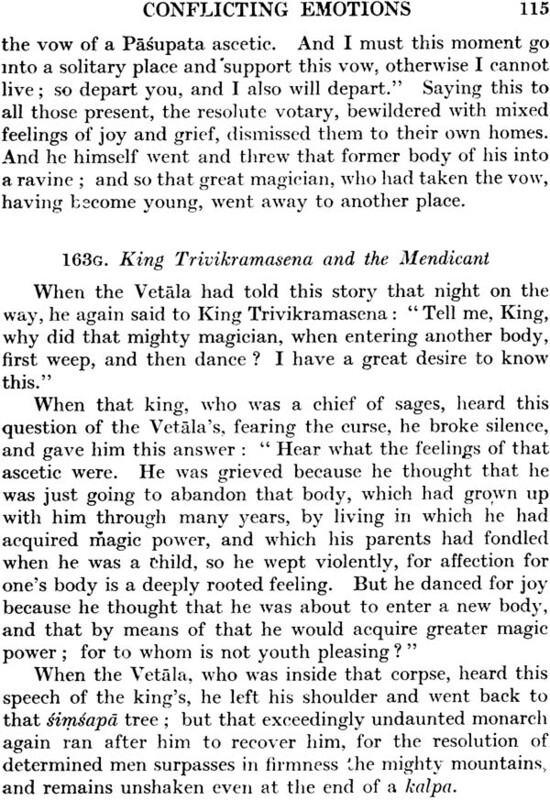 This tragic history forms as dark and grim a background for the setting of Somadeva's tales as did the plague of Florence for Boccaccio's Cenio Novelle nearly three hundred years later. It is, however, these historical events in the history of Kashmir which help us in determining our author's date with any degree of certainty. 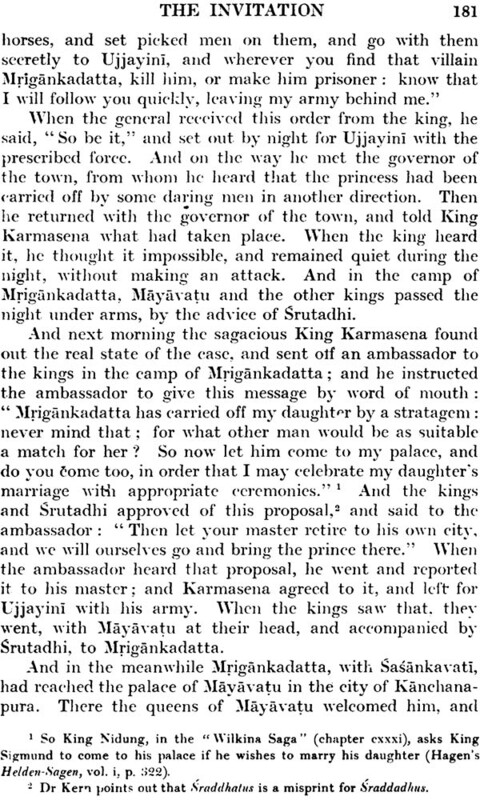 Ananta surrendered his throne in 1063 to his eldest son Kalasa, only to return to it a few years later. In 1077 he again retired. 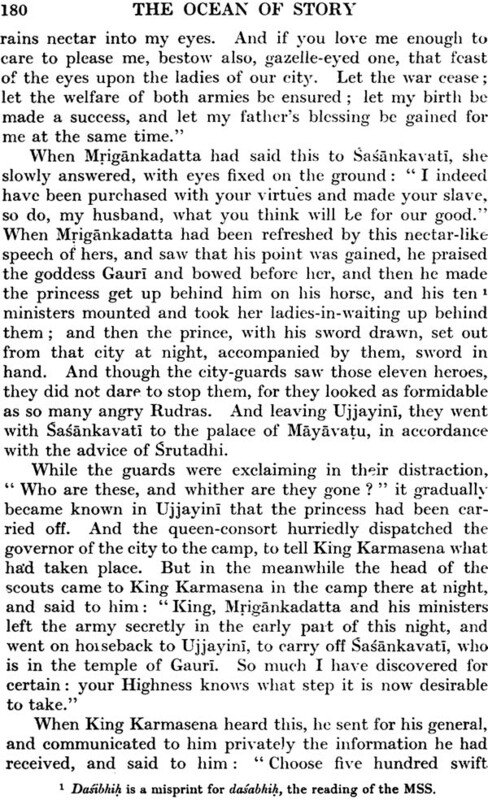 This time Kalasa attacked his father openly and seized all his wealth. 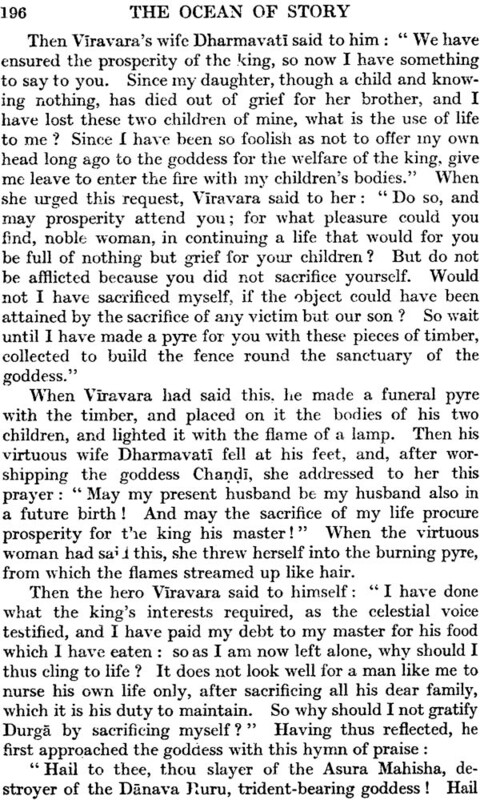 Ananta killed himself in despair and Suryavati threw herself on the funeral pyre. 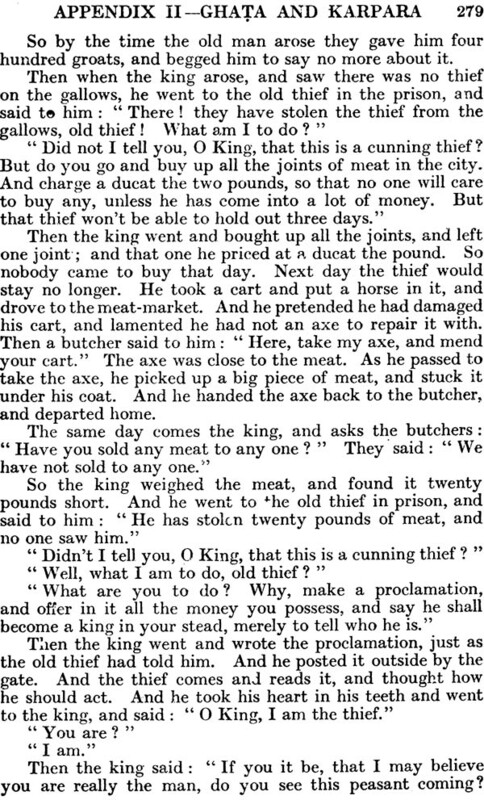 This was in 1081. 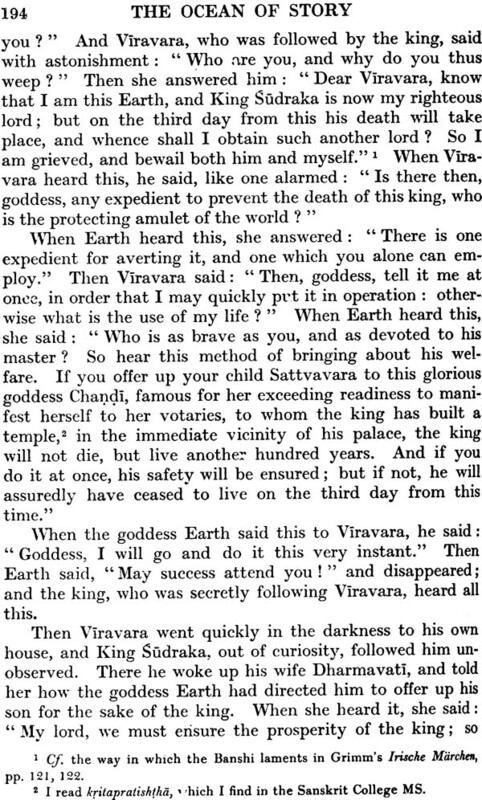 It was between the first and second retirements of Ananta One the throne that Somadeva wrote-possibly about 1070. One can almost imagine that these stories were compiled in an effort to take the mind of the unhappy queen off the troubles and trials which so unremittingly beset her and her court. 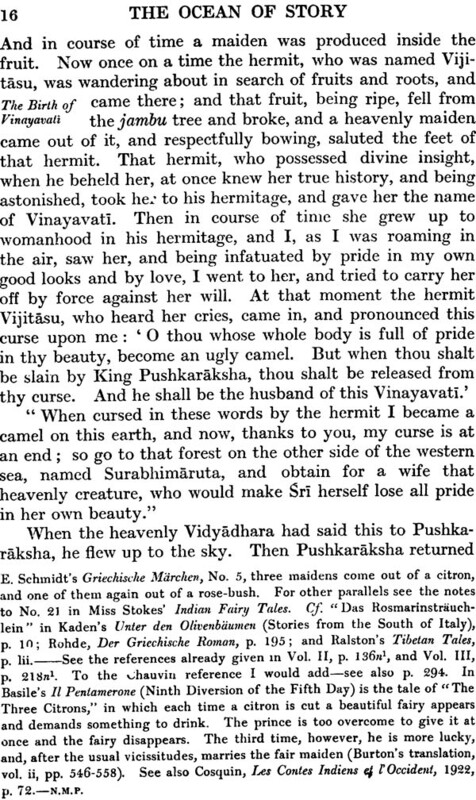 He tells us that the Ocean of Story is not his original work, but is taken from a much larger collection by one Gunadhya, known as the Brihat Katha, or Great Tale. 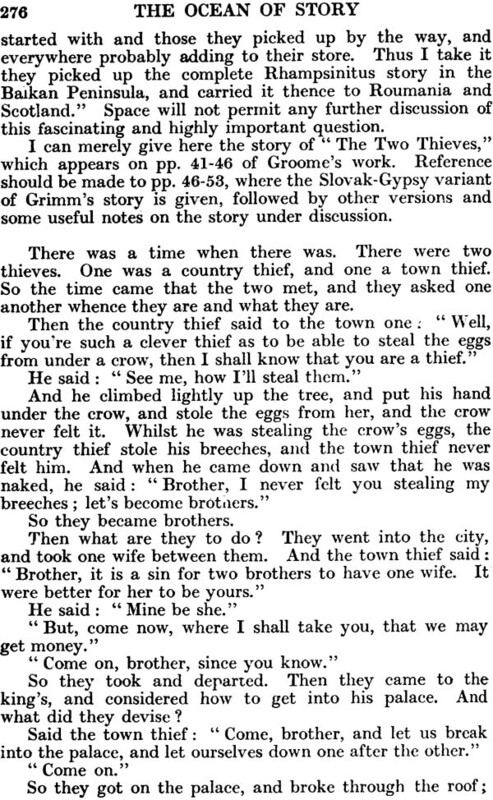 The MS. Of this Great Tale has not been found. 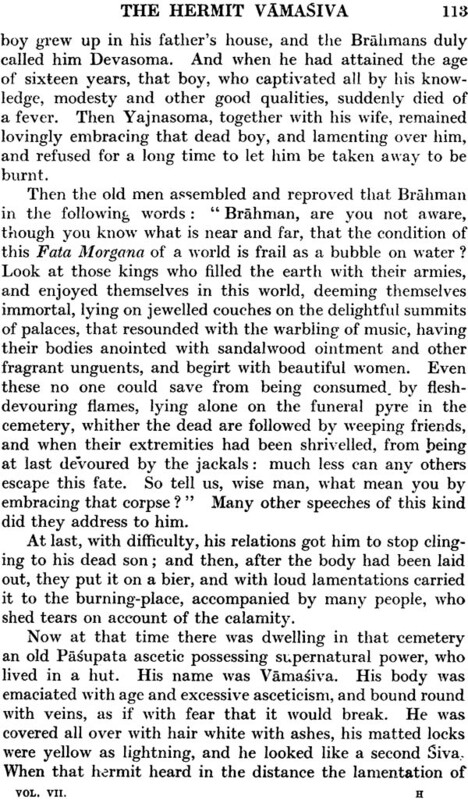 In his first book sSomadeva gives us the legendary history of it, showing how it was related in turn by Siva, Pushpadanta, Kanabhuti Gunadhya and Satavahana; the latter at first rejected it, and in despair Gunadhya began to burn it leaf by leaf-600, 000 distichs are thus lost. 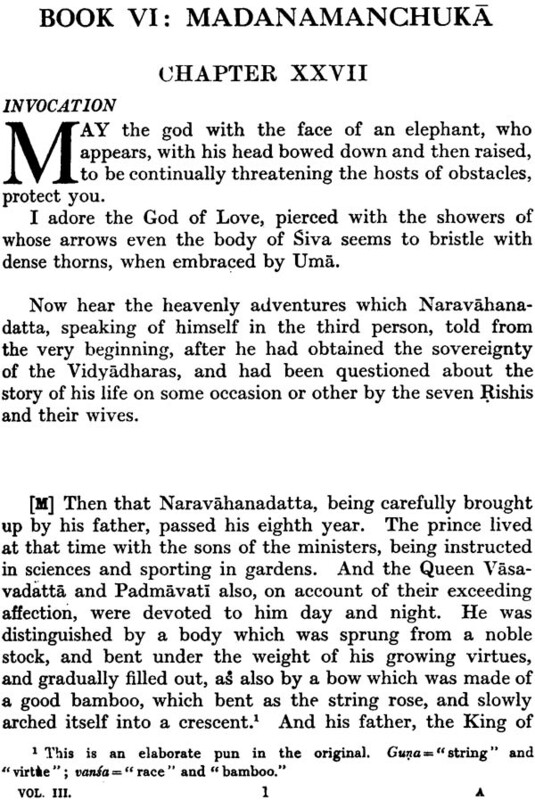 Satavahana reappears and saves the rest (100,000 couplets), which became known as the Brihat Katha. He added to it a lambaka, or book, explaining its marvelous history. 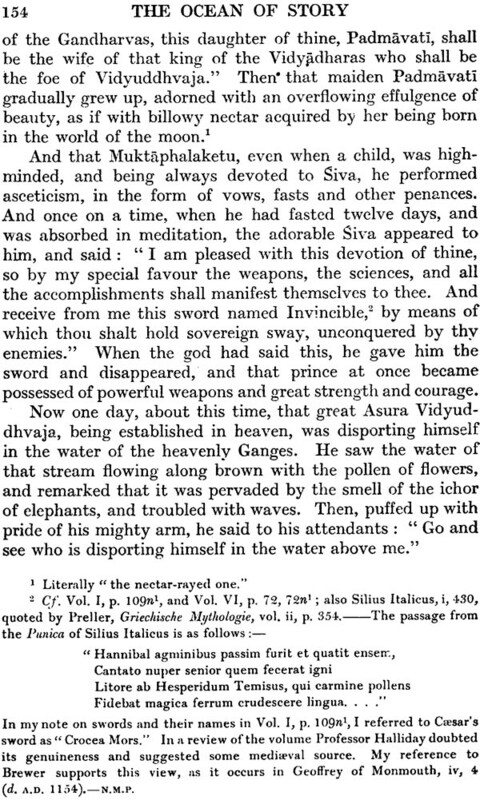 This book Somadeva retains in full, and it forms about half of our first volume. 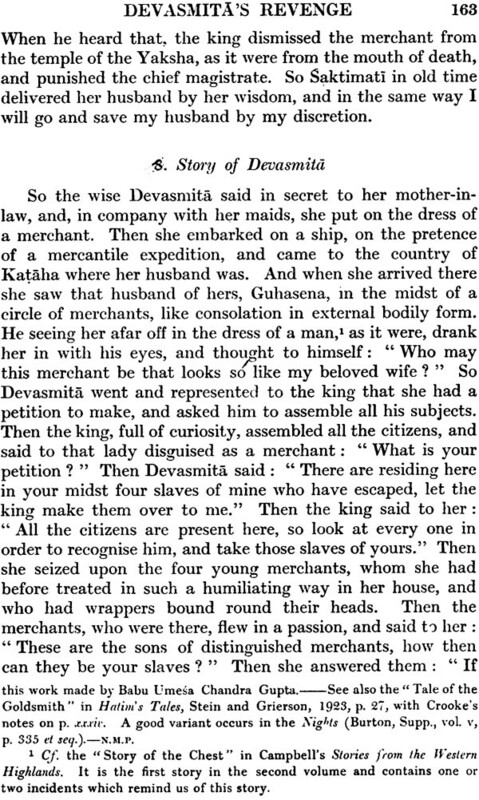 The Ocean of Story is not the only rendition of the Great Tale, for twenty or thirty years previously Kshemendra had written his Brihat Katha Manjari. Compared with Somadeva's work it pales into insignificance, lacking the charm of language, elegance of style, masterly arrangement and metrical skill of the later production. 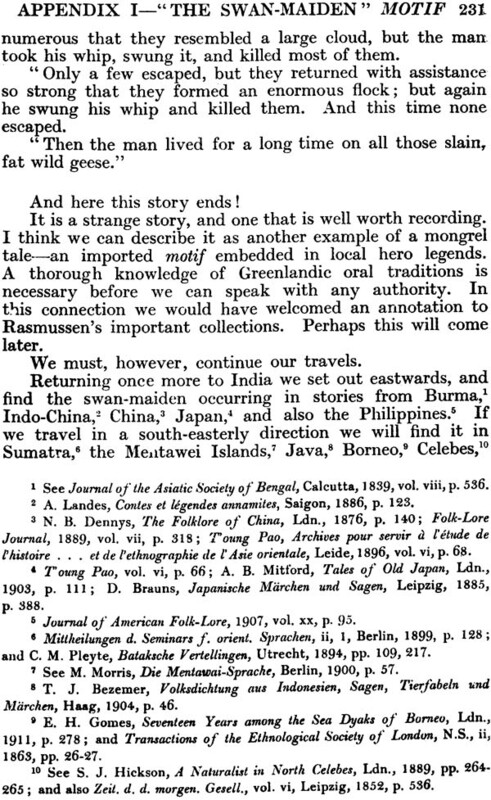 Moreover, Kshemendra's collection is only a third the length of the Ocean of Story An early as 1871 Professor Buhler (Indian Antiquary, p. 302 et seq.) 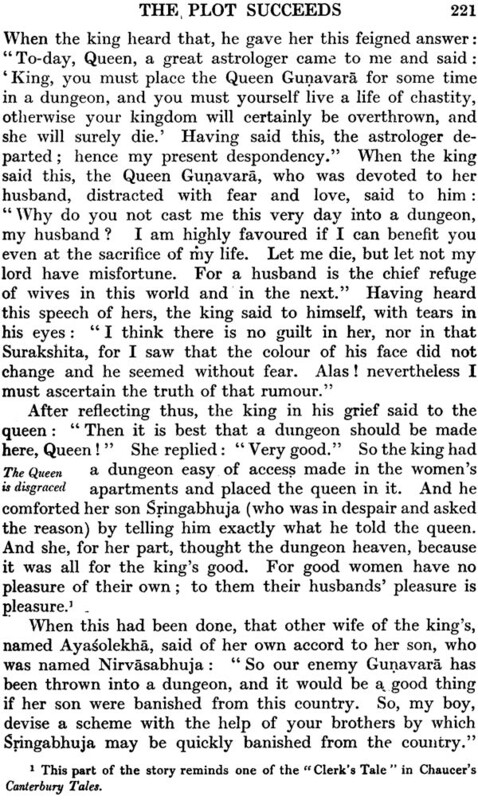 proved these two important facts: firstly, that Somadeva and Kshemendra used the same text, and secondly, that they worked entirely independently from one another. It was, however, many years before this that the Ocean of Story became known to European scholars. 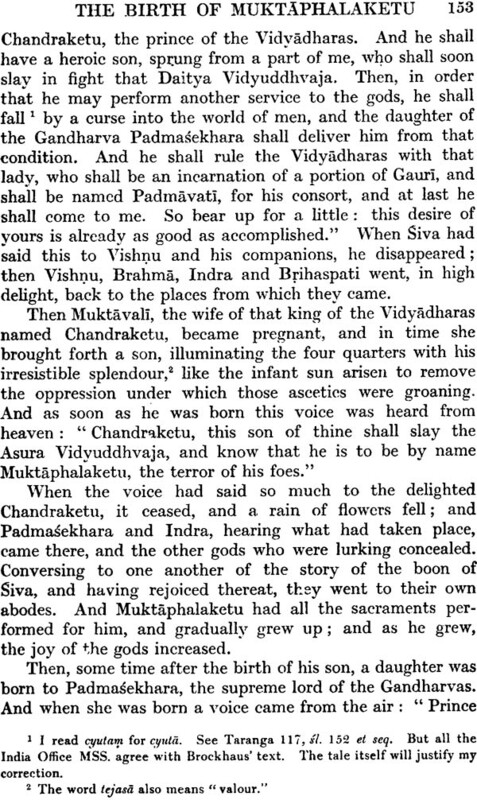 In 1824 that great pioneer of Sanskrit learning, Professor H. H. Wilson, gave a summary of the first five chapters (or lambakas) in the Oriental Quarterly Magazine. The first edition of the work was undertaken by Professor Brockhaus. In 1839 he issued the first five chapters only, and it was not till 1862 that the remaining thirteen appeared. Both publications formed part of the Abhandlungen der Deutschen Morgenlandischen Gesellschaft. 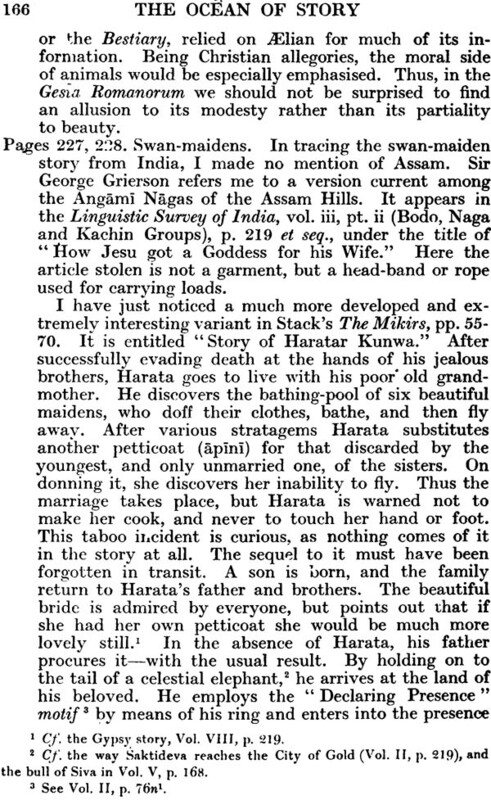 It was this text which Tawney used for his translation published by the Asiatic Society of Bengal in the Bibliotheca Indica, 1880-1884 (the index not appearing till 1887). Brockhaus' edition was based primarily on six MSS., though in the second part of the work he apparently had to so many at his disposal. Tawney was not satisfied with several of Brockhaus' readings, and consequently made numerous fresh renderings or suggestions largely taken from MSS. 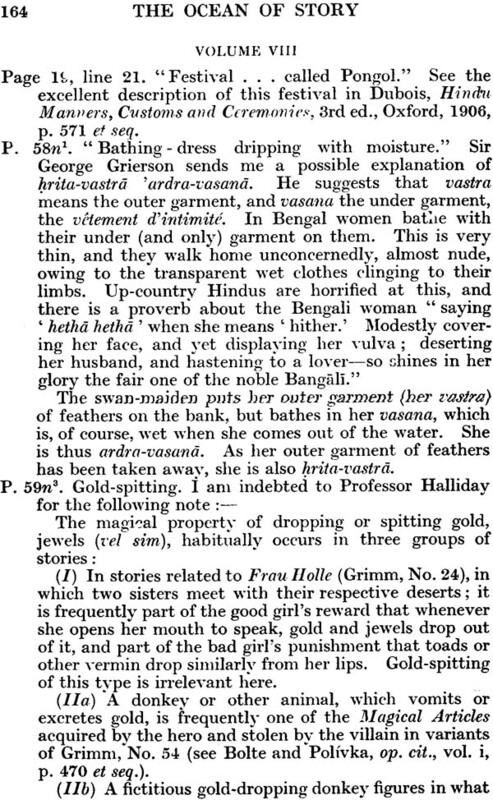 Borrowed from the Calcutta College and from three India Office MSS. Lent him by D Rost. 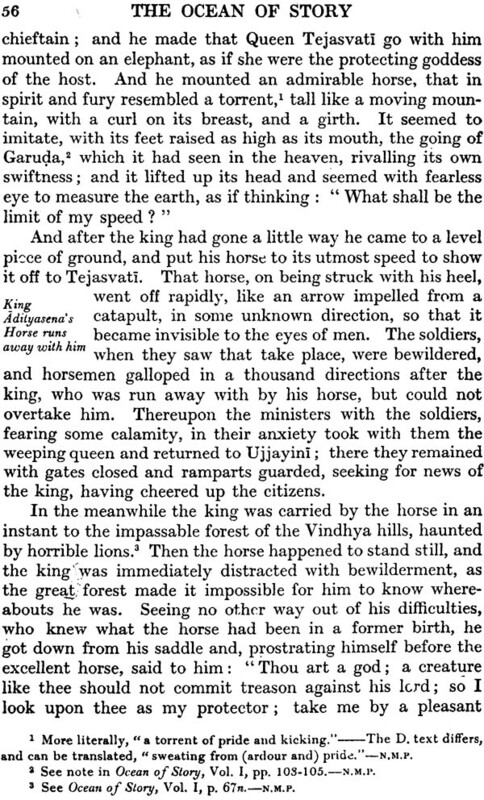 In 1889 Durgaprasad issued the Bombay edition, printed at the Nirnayasagara Press, which was produced from Brockhaus' edition and two Bombay MSS. This is the latest text now available and proves the correctness of many of Tawney's readings where he felt the Brockhaus text was in fault. 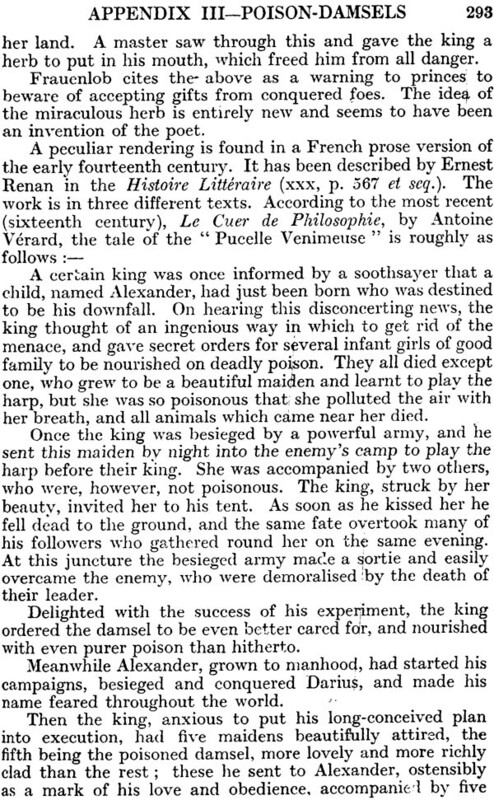 Although a comparison between these two texts would be instructive, its place is not in a general introduction like this. The late Professor Speyer of the Koninklijke Akademic van Wetenschappen te Amsterdam ha written in a most authoritative manner on the whole subject, and has made detailed comparisons and criticisms of the text of Brockhaus and that of Durgaprasad. The Bureau de la section des Lettres of the Amsterdam Academy has very kindly given me leave to incorporate this work of Professor Speyer in the present edition to the Ocean of Story, which I hope to do in a later volume. It is needless to emphasise the value this addition will have to the student of Sanskrit and philology. Turning now to the actual contents of the Ocean of Story, the general reader will continually recognize stories familiar to him from childhood. The student of Indian literature will find well-known tales from the Panchatantra and the Mahabharata, as well as strange fantastic myths of early Rig-Veda days. He will encounter whole series of stories, such as the Vetalapanchavimsati or cycle of Demon stories, But apart from this the work contains much original matter, which Somadeva handles with the ease and skill of a master of his art. The appeal of his stories is immediate and lasting, and time has proved incapable of robbing them of their freshness and fascination. 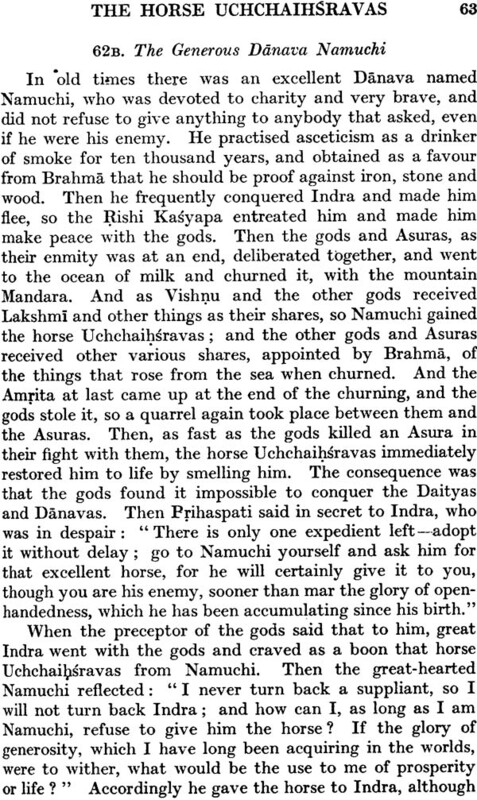 The Ocean of Story, therefore, may be regarded as an attempt to present as a single whole the essence of that rich Indian imagination which had found expression in a literature and art stretching back to the days of the intermingling of the Aryan and Dravidian stocks nearly two thousand years before the Christian era. India is indeed the home of story-telling. It was from here that the Persians learned the art, and passed it on to the Arabians. 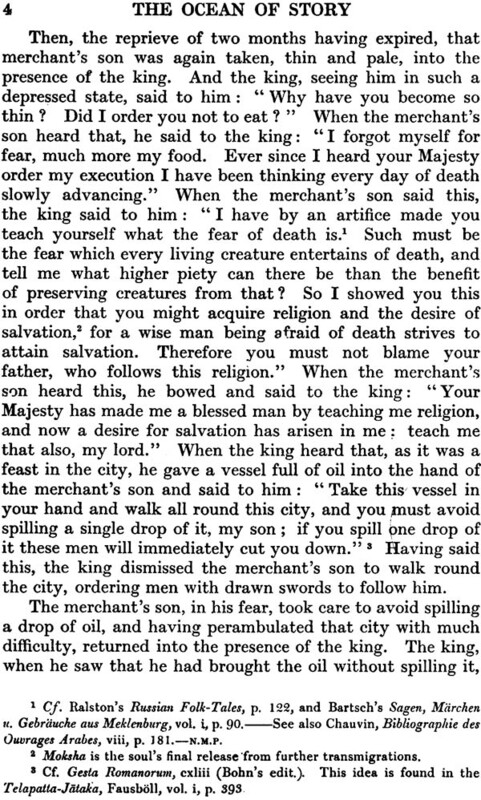 From the Middle East the tales found their way to Constantinople and Venice, and finally appeared in the pages of Boccaccio, Chaucer and La Fontaine. 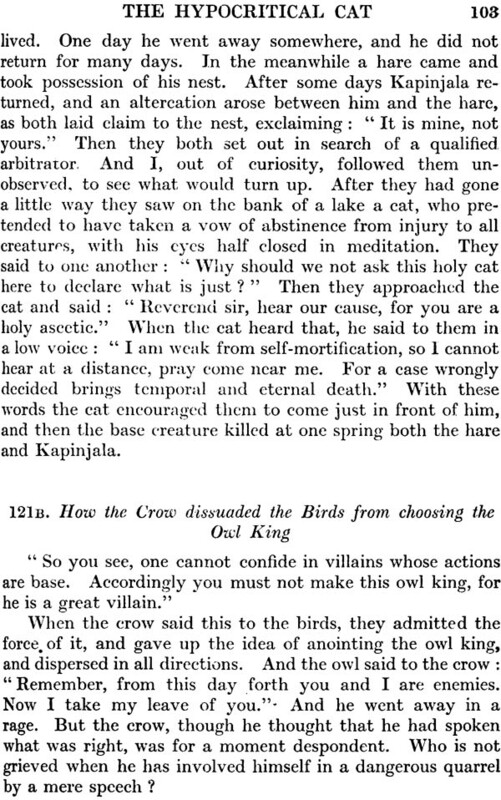 It was not until Benfey wrote his famous introduction to the Panchatantra that we began to realize what a great debt the Western tales owed to the East. 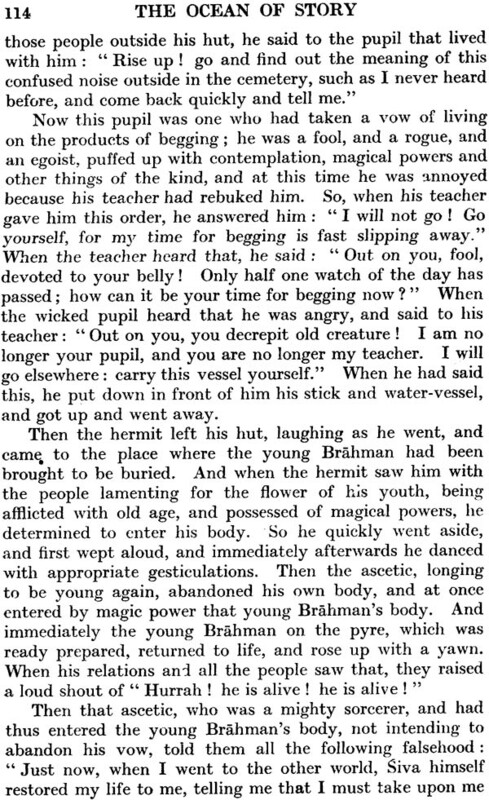 Although it is well known to students of folk-lore, I am still hoping to see the great work of Benfey translated into English and suitably annotated by such a body as the Folk-Lore Society. When Galland first introduced the Arabian Nights into Europe at the beginning of the eighteenth century the chief attraction was the originality of the Oriental settings and the strange manners and customs, now for the first time described. 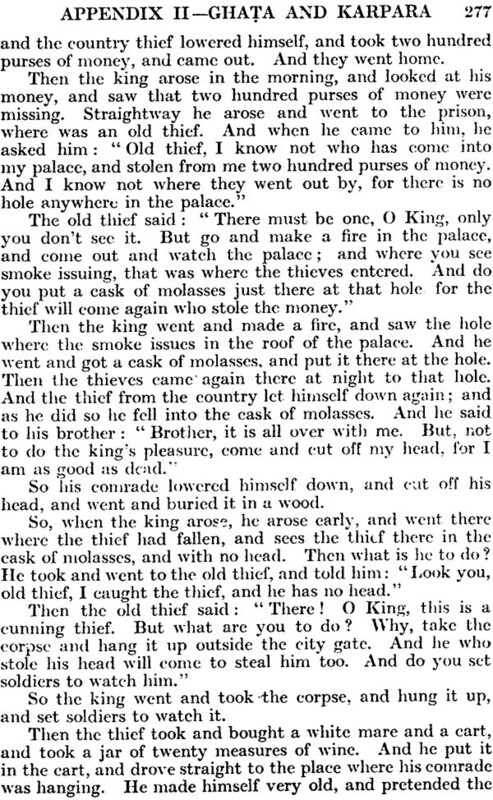 In was thought that he had made up the tales himself. In time many of the originals were found and people changed their opinions. 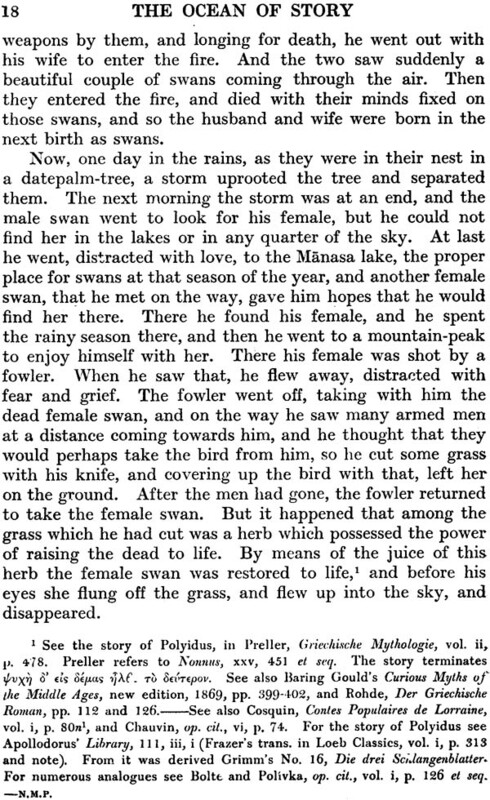 Even in Burton's day there still remained a number of Galland's tales of which no text could be traced, although from the very first Burton maintained that such texts did exist. The original "Aladdin" was discovered while Burton's edition was actually coming out, and "Ali Baba" was found by Dr D. B. Macdonald as recently as 1908. 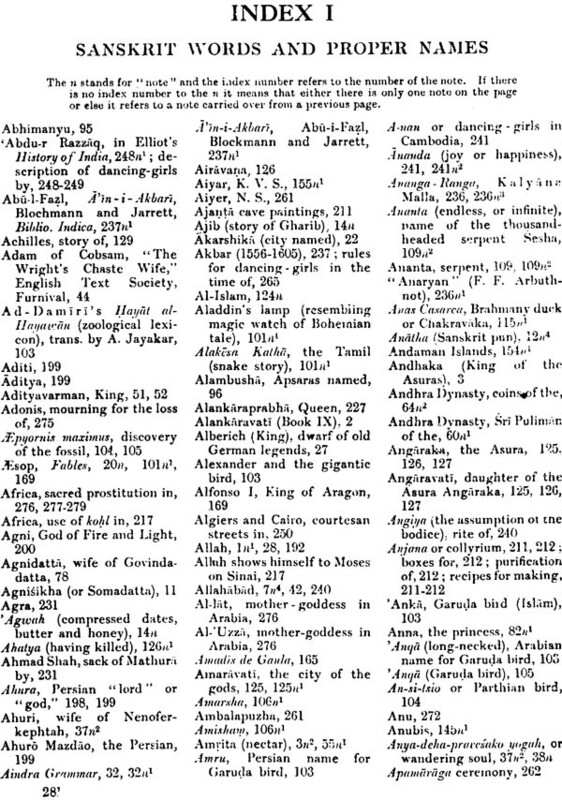 The influence of the Arabian Nights on European Contes populaires must not be overlooked, nor must its unde derivator be forgotten. It is only in quite recent times that the Indian origin of much of the Alf Layla Wa Layla has been realized, and the sifting of the different recensions been commenced. 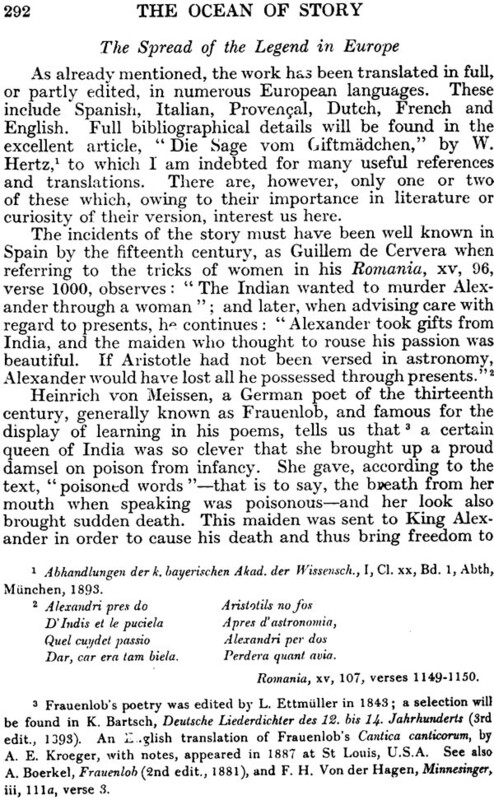 The great advance made in the study of Sanskrit has shown that incidents in stories well known to every European child existed in India over two thousand years ago. This does not necessarily mean that the story, or incident in the story, traveled, slowly but surely, from India to the English nursery. 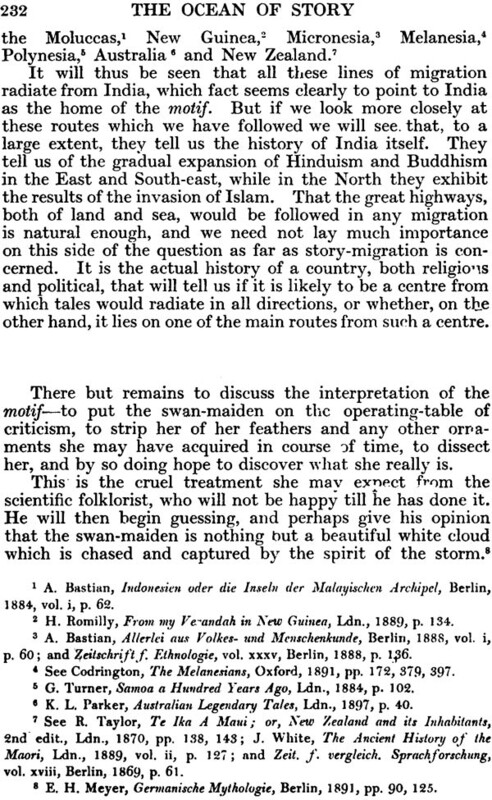 The whole question is most fascinating, and I shall have occasion to discuss the migration of some of the tales as they appear' it is particularly interesting to note that some of the early stories from the Egyptian papyri are so similar to tales in the Ocean of Story that one is led at once to suspect some connection. Although I am leaving further discussion on the subject to the notes and appendices which appear in each of these ten volumes, yet I feel I must mention one factor, which we must not forget-environment. 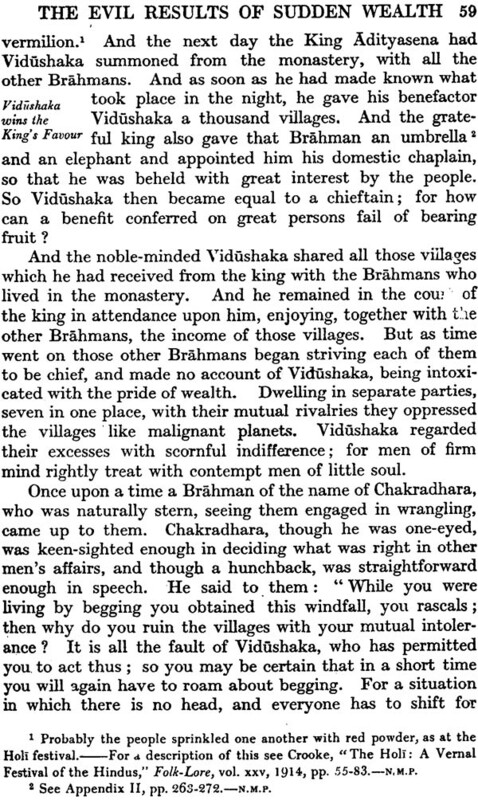 In warm latitudes the temperature had naturally produced a general laxity in the habits of the people, and in Eastern countries the often, exaggerated code of hospitality, coupled with the exclusion of women and consequential gatherings of men in the cool of the evenings, has given great impetus to story-telling. So much so, indeed, that it has produced the Rawi, or professional story-teller-an important member of the community unknown in cooler latitudes, where the story-telling is almost entirely confined to the family circle. Thus the migratory possibilities of tales in the East are far greater than those in the West. Added to this is the antiquity of Eastern civilization, compared with which hat of the West is but of yesterday. A study of the movements of Asiatic peoples, their early voyages of exploration and trade, their intermarrying, and their extensive commerce in slaves of every nationality will help to show how not only their stories, but also the customs, architecture, religions and languages, became transplanted to foreign soil, where they either throve and influenced their surroundings, or found their new environment too strong for them. Thus in this great storehouse of fiction, the Ocean of Story, we shall continually come upon tales in the earliest form yet known. It is here that I intend to trace the literary history of the incident, trait, or motif and, by such evidence as I can procure, try to formulate some definite ideas as to its true history. In many cases this will be impossible, in others little more than mere conjecture. Full bibliographical details will be given, so that readers can form their own opinions and draw their own conclusions concerning this most fascinating study. With regard to the method of transliteration adopted throughout the work, I have followed, as far as possible, the system approved by the International Oriental Congress of 1894. This system is almost identical with that approved by the Committee on Transliteration appointed by the Council of the Royal Asiatic Society in January 1922. 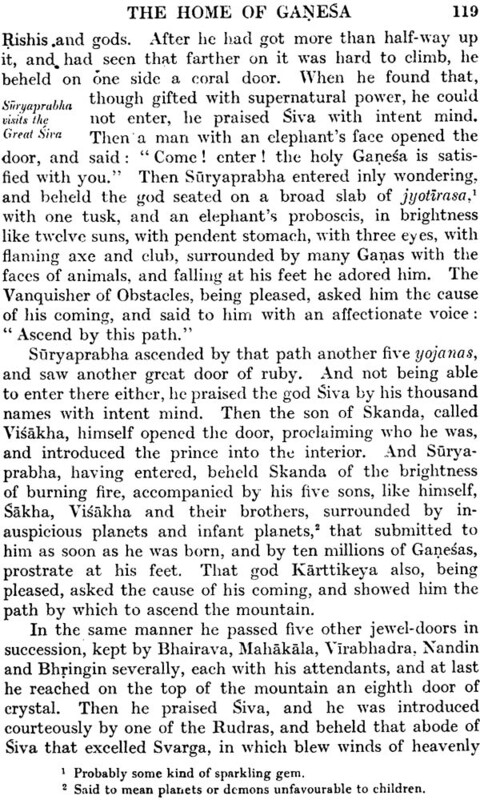 For full tables of the Sanskrit signs and their English equivalents reference should be made to the Journ. Roy. As. 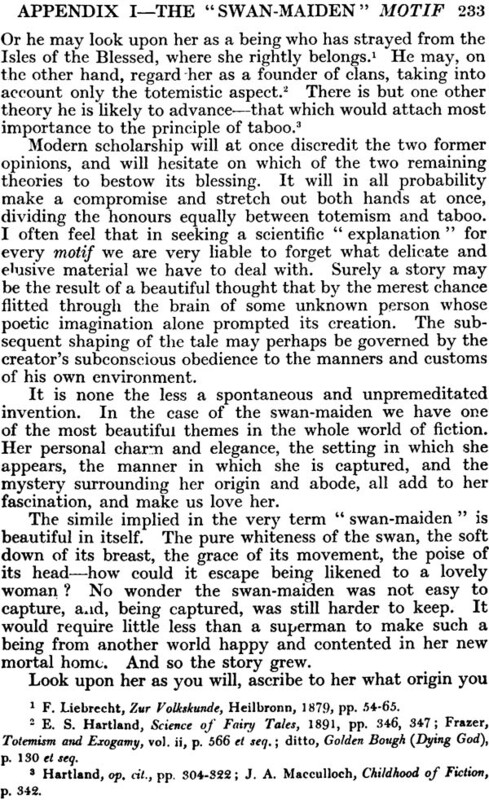 Soc., July 1923, pp. 525-531; and January 1924, pp. 171-173- In the case of the long quantity of a vowel, Tawney macron, or horizontal line. It is interesting to mention that tawney regretted having used the acute accent and specially asked me to change it. 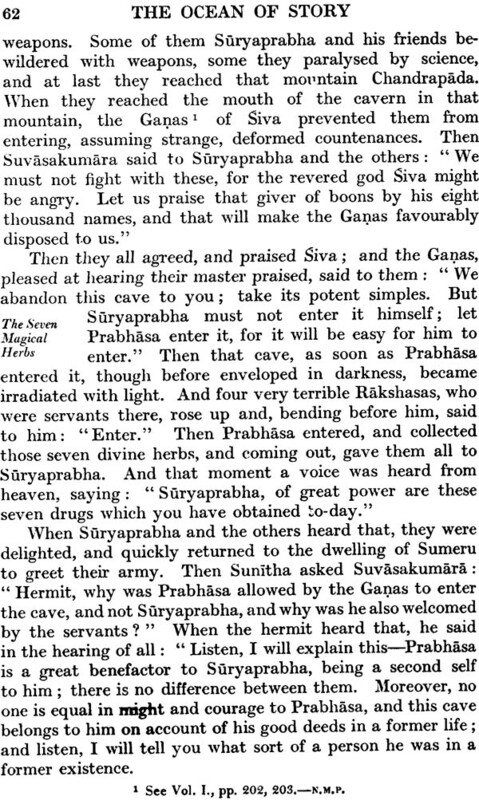 Short vowels have no mark, thus the I in Siva should not be pronounced long. Passing on to the translation itself, I would stress the fact that Tawney was most anxious to convey in his English rendering not only the meaning, but also the atmosphere of the original. In this he has succeeded, and the ancient Hindu environment at once makes itself felt. 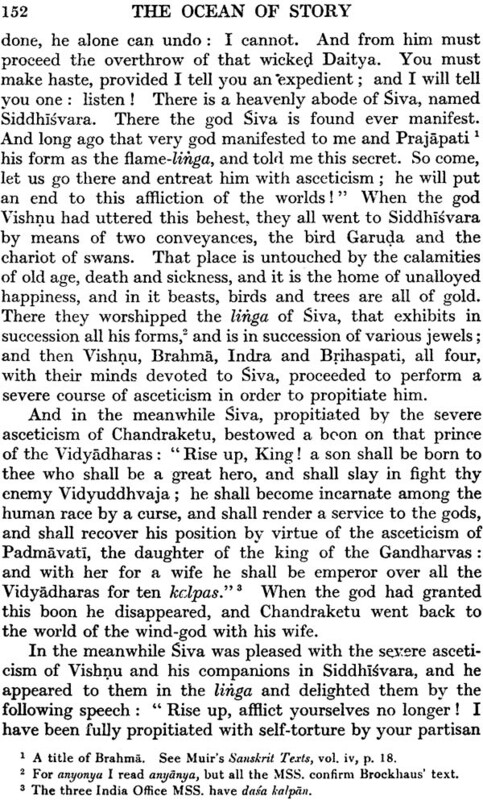 In a previous work, Two Centuries of Bhartrihari, Tawney alludes to this very point. "I am sensible," he says, "that, in the present attempt, I have retained much local colouring. 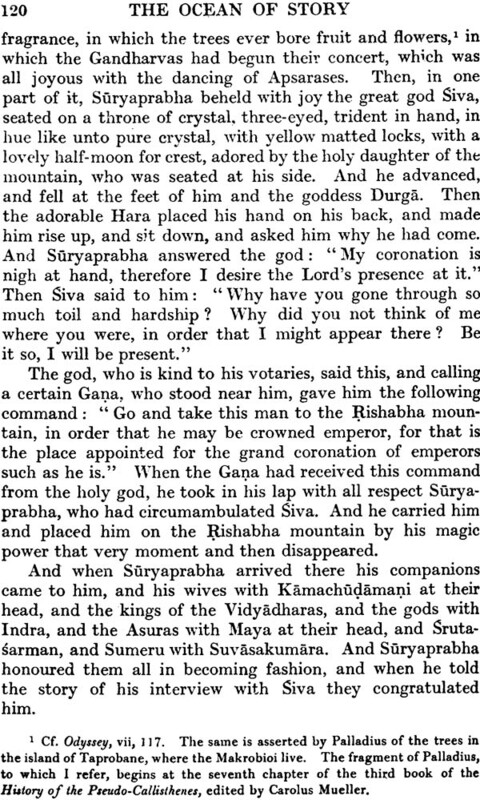 For instance, the idea of worshipping the feet of a god or great man, though it frequently occurs in Indian literature, will undoubtedly move the laughter of Englishmen unacquainted with Sanskrit, especially if they happen to belong to that class of readers who rivet their attention on the accidental and remain blind to the essential. But a certain measure of fidelity to the original, even at the risk of making oneself ridiculous, is better than the studied dishonesty which characterizes so many translations of Oriental poets." 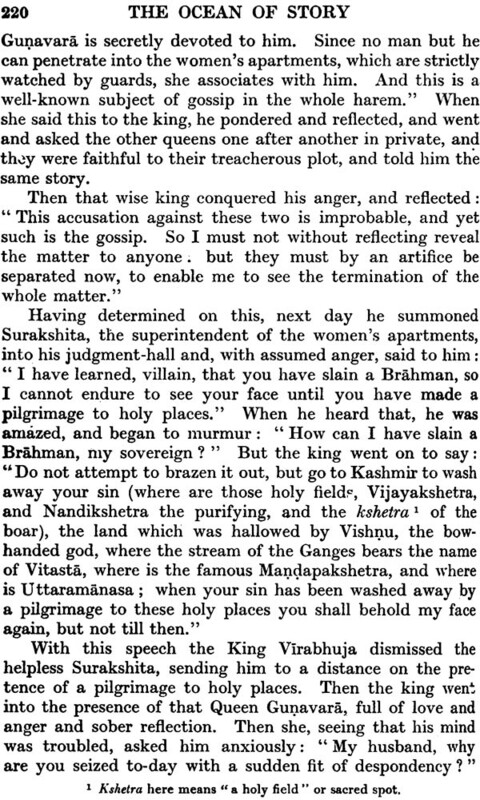 Although the Ocean of Story doubtless contains phrases, similes, metaphors and constructions which may at first strike the "Englishman unacquainted with Sanskrit" as unusual and exaggerated, yet I feel that as he reads he will find that it is those very "peculiarities" which are slowly creating an un-English, but none the less delightful, atmosphere, and which give the whole work a charm all its own. In a work of this magnitude it is necessary to say come thing of the arrangement of the text, the numbering of the stories, the scope of the fresh annotation and the system of indexing employed. 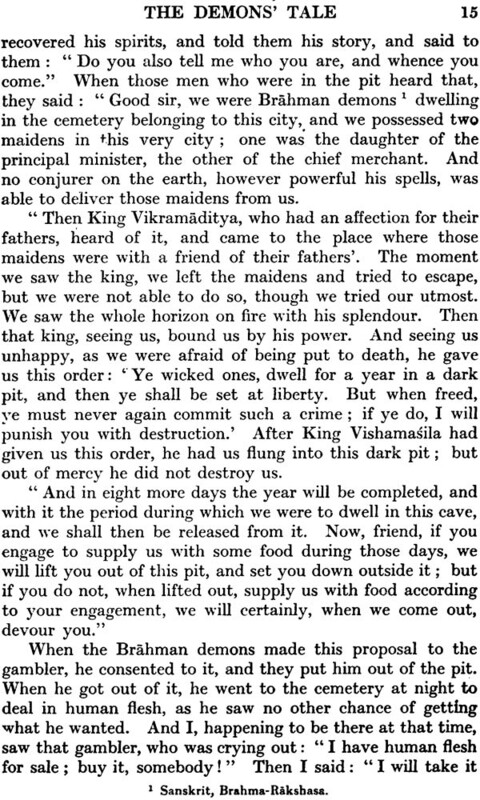 The text is left entirely as translated by the late Charles Tawney except where certain omissions have been adjusted or more literal renderings added. In one or two cases a short story left out by Tawney has been restored, thus making the work absolutely complete in every detail. These fresh translations have been made by Dr L. D. Barnett, Keeper of the Department of Oriental Printed Books and MSS. In the British Museum. 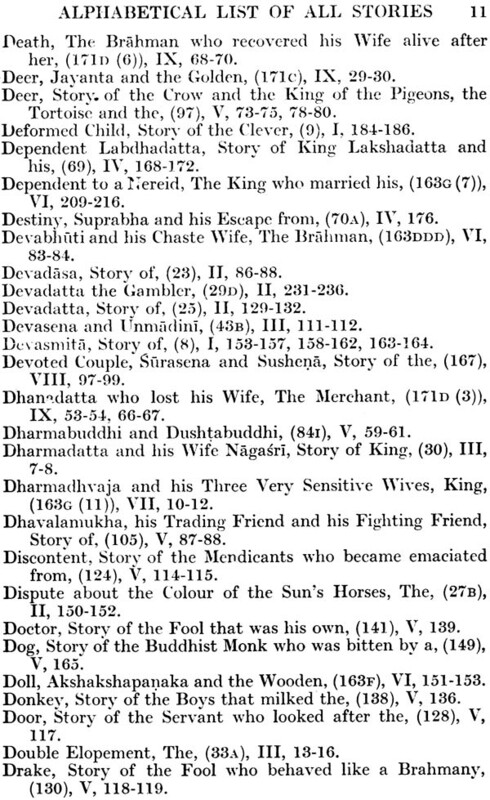 In Volume I no fresh translations have been added except where the text of Durgaprasad seems to be a distinct improvement on that of Brockhaus. In these cases I have simply added a note at the bottom of the page giving the new reading. The system of numbering the stories requires a detailed explanation. In order that the reader may know exactly what story he is reading and can pick up the thread of a tale long since suspended, each story will have a distinct number. It will be numbered by an Arabic numeral; while a sub-story will have the addition of a letter, A, B, C, etc., and a sub-sub-story will have the letter repeated. It often happens that a story is broken off three or four times; each time we return to that main story its special number reappears with it. Thus every tale will be kept separate and facilities for folk-lore reference will be afforded. Sometimes in a long story numerous incidents occur which cannot be numbered separately. 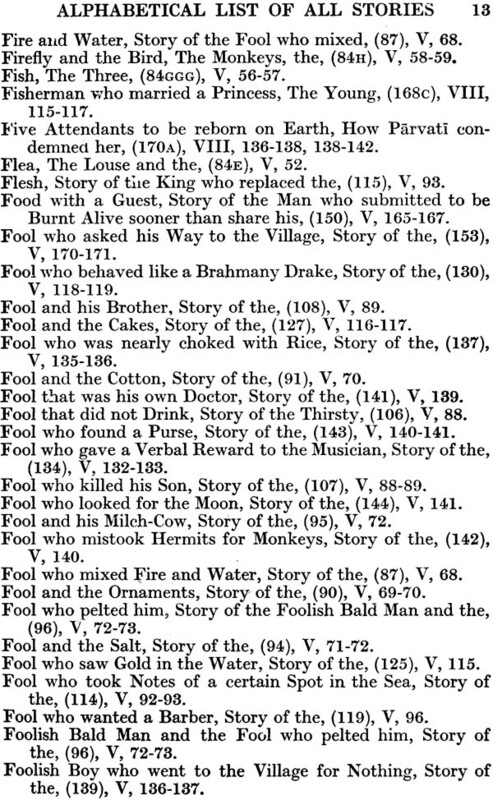 These are shown by side-headings, which can, however, easily be catalogued or referred to by the help of the number of the story in which they occur. Two considerations other than those mentioned need explanation. 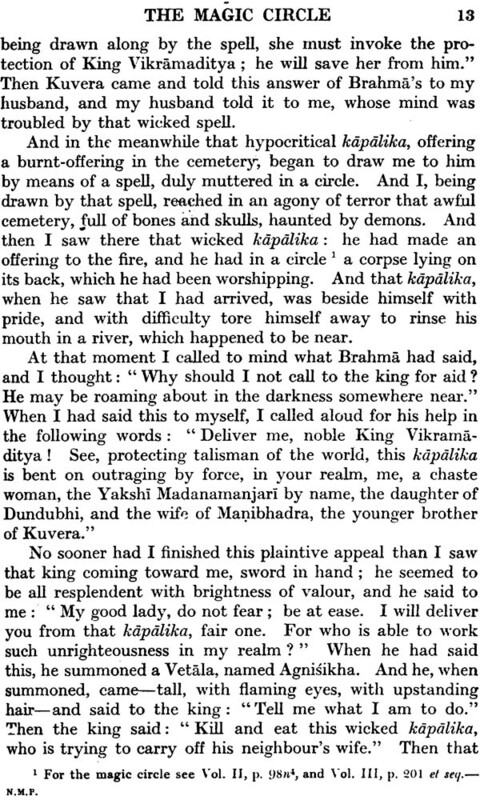 There is one main story which runs throughout the entire wok, though towards the end it takes a very back seat, especially where a large collection of stories, like the Vikram cycle, appear. This main story is numbered M, without any Arabic numeral. Secondly, Book I is all introductory. It too has a main story running through it, which I call MI-i.e. Main (Introduction). The first story is 1, the first sub-story 1A, the first sub-sub-story 1AA and so on. There are four stories in MI, so when Book II commences the first story is 5, as the numbering does not start again, but runs straight on. A glance at the Contents pages at the very beginning of this volume will explain exactly what I am trying to covey. WE will now turn to the question of the fresh annotations. So great have been our strides in folk-lore, anthropology and their kindred subjects since Tawney's day, that many of the original notes can be largely supplemented, corrected, or entirely rewritten in the light of recent research. Further, in some cases subjects are touched n that in Victorian days would be passed over in silence, but to-day convention allows a scholarly treatment of them, and does not demand that they "Be veiled in the obscurity of a learned tongue."
. If notes are of only a few lines they appear at the bottom of the page;; if longer, and there are few other notes coming immediately after, the note goes at the bottom of two or three consecutive pages, If, however, the opposite is the case, the note is put separately at the end of the chapter. Thus in some instances there will be two or three notes at the end of a chapter. Sometimes we light on a subject on which no comprehensive article has been written. Such a note may run to thirty or more pages. Thus, then, forms an appendix at the end of a volume. Each note which I have written is initialed by me, so that it will be quite clear which notes are mine and which those of Tawney. Occasionally a note may be written by both Tawney and myself. In these cases his remarks come first, and are separated from mine which follow by a rule, thus:- In some of these notes recent research may have proved, disproved, or amplified Tawney's original note. It is therefore considered best to give both the original note and the fresh one following it. 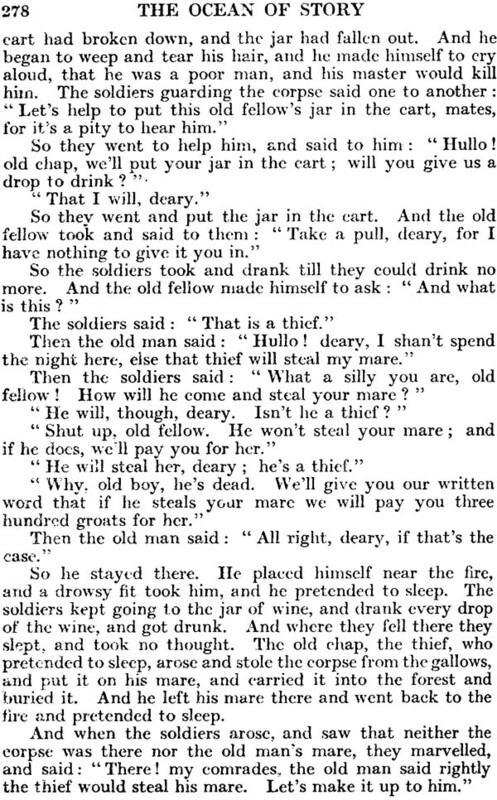 It often happens that an old edition of a work quoted by Tawney has been completely superseded by a more recent one. In these cases if the reference is more detailed and up-to-date in the new edition, the original one is disregarded. English translations of many works can now be quoted which in Tawney's day were only to be found in their original tongues, or in an Italian or German translation. These fresh references have accordingly been added. 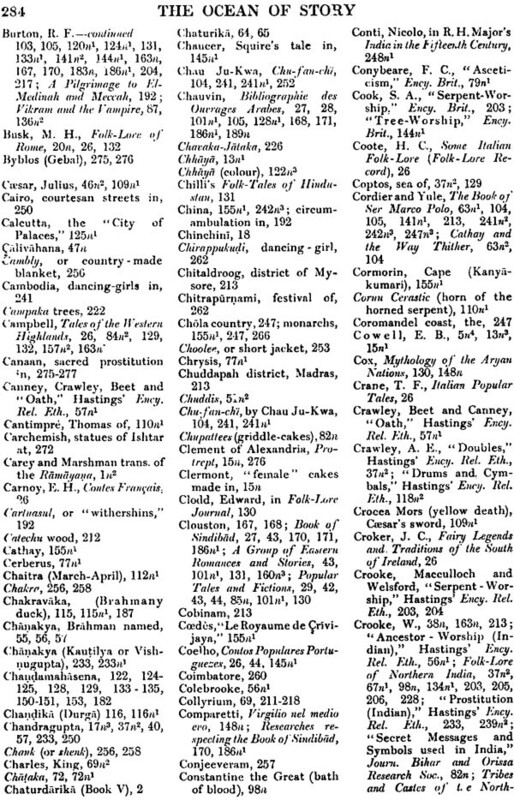 Fresh, as is also the system of numbering the stories, and the elaborate indexing. At the end of each volume are two indices. 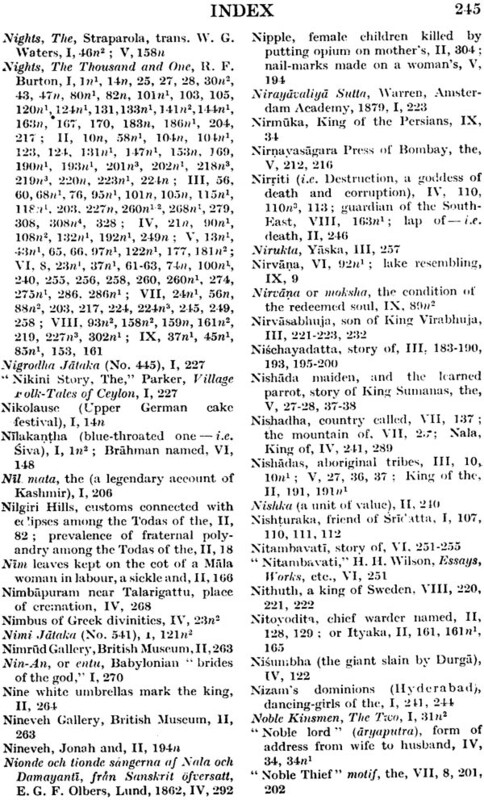 The first contains all Sanskrit words and names, also proper names of peoples, towns, etc., in any language. 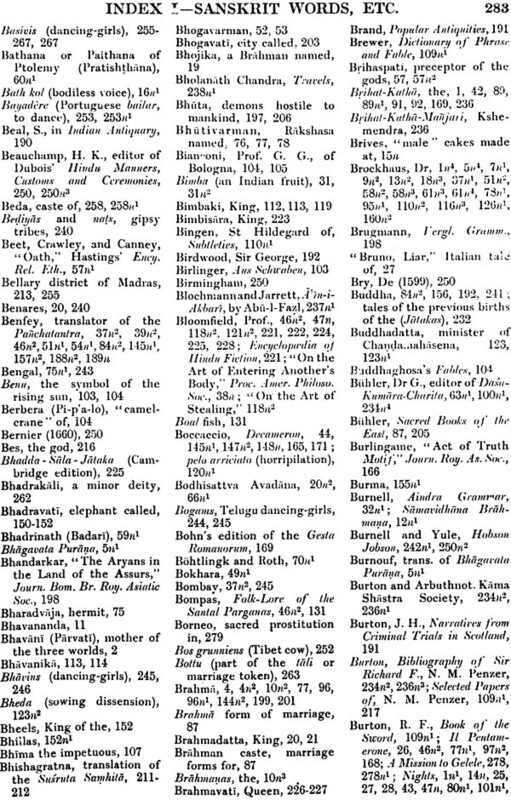 The second, and by far the larger of the two, is the General Index. Important references may be cross-indexed six times. Nothing of the least possible importance is omitted: every note, appendix and every portion of the text is fully indexed. If space permits I shall include a volume containing the two accumulated indices of the entire work, together with a list of authors, a bibliography of the Ocean of Story itself, and a list of all the stories in alphabetical order. In conclusion I would like to acknowledge the help I have received from so many private individuals and learned institutions. I the first place I would particularly mention those gentlemen who have read through my proofs, or some particular portion of them, and given me most valuable advice: Sir Richard Temple, Dr. L.D. Barnett, Professosr R. L. Turner, Mr C. Fenton (who has also drawn my attention to important Central American analogies) and Sir Aurel Stein; while Mr R. Campbell Thompson has criticized my Babylonian and Assyrian notes, and Sir Wallis Budge, Dr H. R. Hall, and Professor G. Eliot Smith have helped me in points connected with Egyptology. As the list of correspondents giving information increases nearly every day, it is impossible to include them all in this first volume. I would, however, particularly mention Mr. J. Allen, Professor Maurice Bloomfield, Mr. F. H. Brown, Mr A. G. Ellis, Mr R. E. Enthoven, Dr Lionel Giles, M T. A. Joyce, Mr W. G. Partington, Brigadier-General Sir Pecy Sykes, Mr Robert Sewell, Dr F. W. Thomas and Mr Edgar Thurston. Of the following institutions and learned societies I would thank the librarians and their assistants for the valuable help they have given and kindness they have always shown:-the Royal Asiatic Society, the Royal Geographical Society, the Geological Society, the Folk-Lore Society, the India Office Library, School of Oriental Studies Library, the British Museum Library, the Library of the Royal College of Surgeons, the Wellcombe Medical Museum, the Koninklijke Akademie van Wetenschappen te Amsterdam, and finally I owe a special debt of gratitude to the Asiatic Society of Bengal for their permission to use the original edition of the Katha Sarit Sagara. With the issue of this second volume of the Ocean of Story I would like to take the opportunity of thanking my many subscribers for their kind support. The appreciative and sympathetic manner in which the reviewers have received the first volume of the work has also been most encouraging. Subscribers will be pleased to hear that great progress is being made with the subsequent volumes. Volume III is now in the press and Volume IV is well in hand. It remains but to acknowledge the kind help I have received from so many quarters. 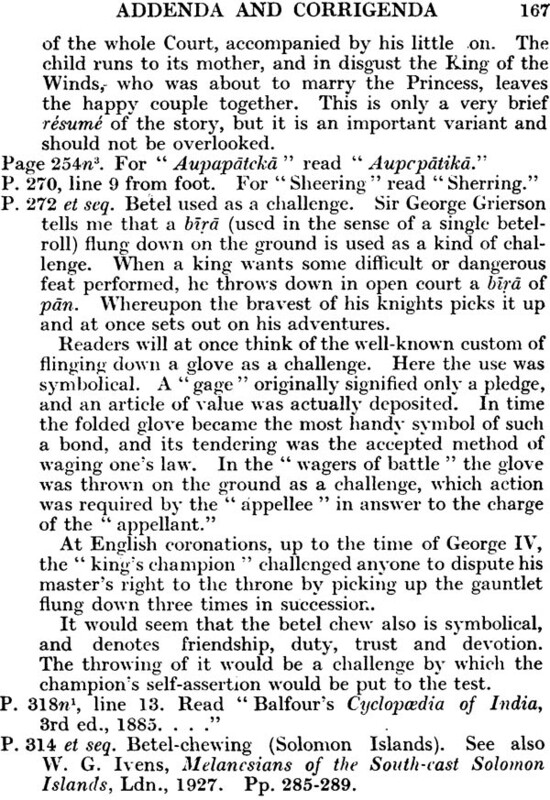 To Sir George Grierson is due special thanks for this most interesting and relevant Foreword. I was particularly gratified when Sir George so kindly consented to write this, as I know how pleased Mr. Tawney would have been to have seen the name of his old friend connected with the present edition of his magnum opus. 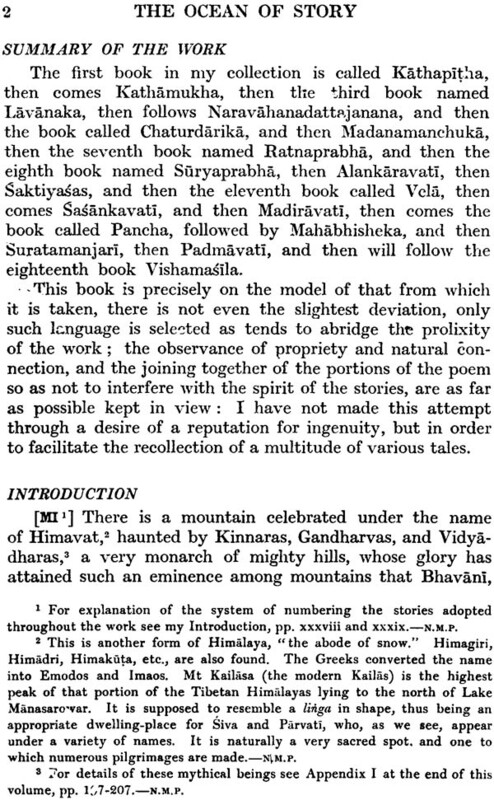 Dr. L. D. Barnett has again read through all my proofs, and has not only given me the advantage of his inexhaustible store of Sanskrit knowledge, but has translated afresh those passages which needed revision, owing either to improved readings in the D. text or to omissions made by Mr. Tawney himself. Mr. C. Fenton has also been through the proofs from the general point of view, and his microscopic eye has detected many errors which I had passed unnoticed. In addition to which his knowledge of Central American ancient history and mythology has been particularly helpful, especially in portions of the "Poison-damsel" appendix. 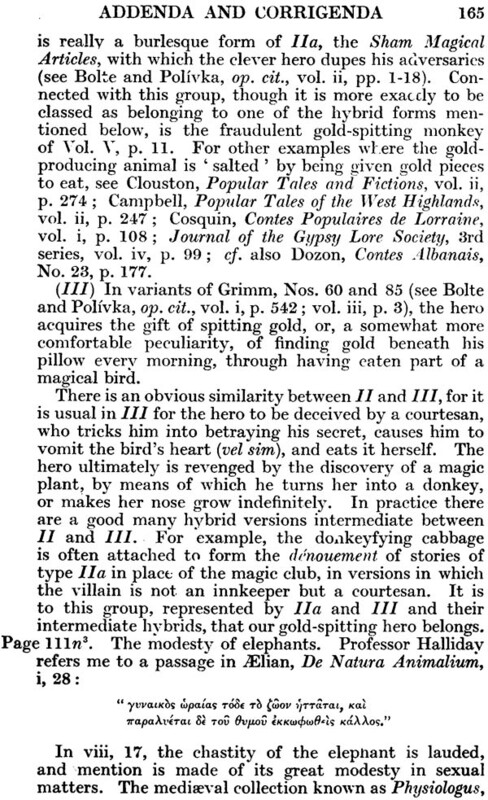 To the list of names already given in my Introduction to Volume I, I would add those of Mr. H. Balfour, Professor Henri Cordier, Dr. M. Gaster, Rev. A. S. Geden, Mr. F. H. Hudleston, Mr. Edward Hutton, Professor Julius Jolly, Dr. A. B. Keith, Dr. D. B. Macdonald, Professor D. S. Margoliouth, Miss Joan Procter, Professor C. G. Seligman, and Mr. P. G. Trendell. The present volume contains more text than either of the two preceding ones, and Vol. IV will carry us to the end of Mr. Tawney's first volume. Dr Barnett continues his proof-reading and has given invaluable advice on a number of points. In the absence of Mr Fenton, who is pursuing his archaeological studies in Central America, my old friend, Mr Douglas Marshal, has kindly read through the proofs, making may valuable suggestions. Any fresh acknowledgements are duly made in the notes themselves. 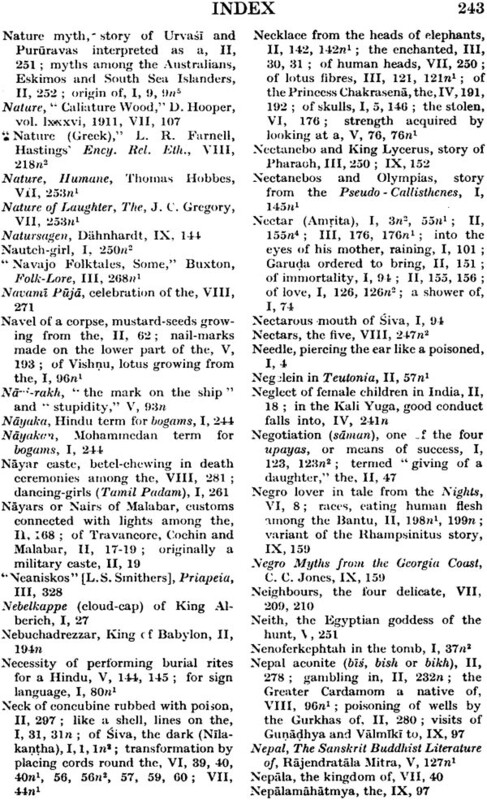 As I mentioned in the Introduction to Volume I, the Ocean of Story is divided into one hundred and twenty-four chapters, called tarangas, "waves" or "billows"; while Brockhaus, following Somadeva's metaphoric nomenclature, made a further and independent division into eighteen Books, which he called lambakas, "surges" or "swells." 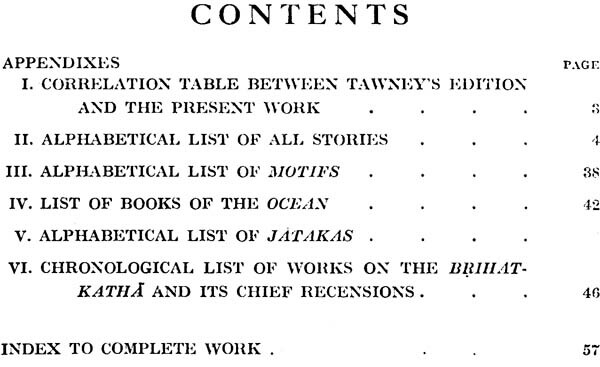 Following Brockhaus' text, Tawney issued his translation in two volumes, each containing nine Books. This volume takes us to the end of Book IX and, with the three previous volumes, corresponds to Tawney's first volume. 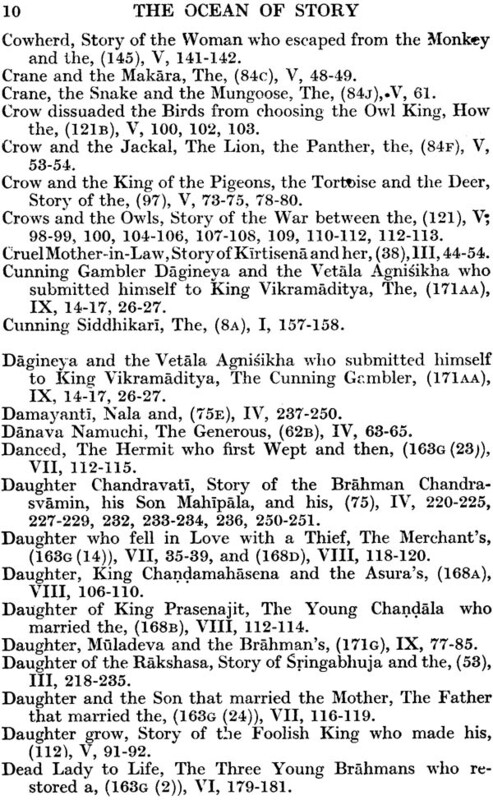 Books X-XVIII, however, contain much more matter than the first nine Books, owing to the inclusion of such large cycles of stories as the Panchatantra (which will appear in my next volume) and the Vetala-Panchavimsati. these Books will probably occupy five more volumes of the present edition, but I hope to be able to reserve Volume X for the accumulated indexes, etc. 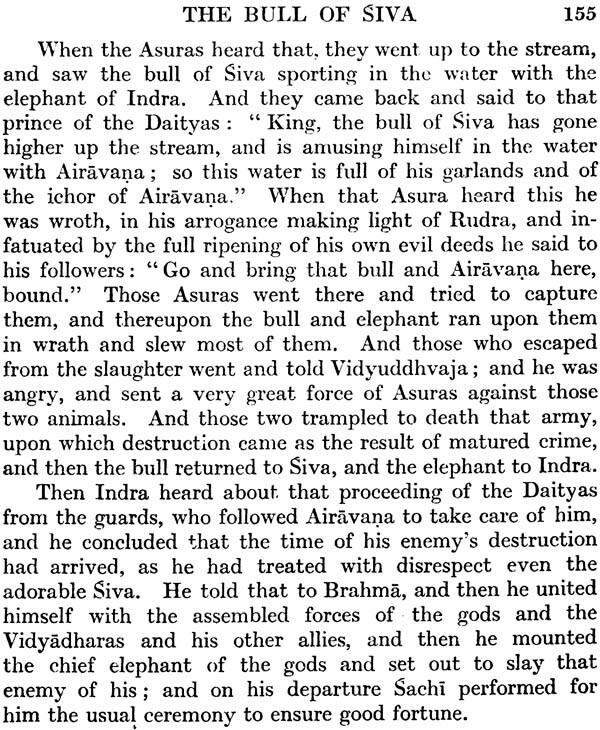 The first hundred and twenty-one pages of the present volume are taken up with the "Story of Suryaprabha and how he attained Sovereignty over the Vidyadharas," which, with its few sub-stories, constitutes Book VIII. It is much the longest tale we have had so far, although it is certainly not the most interesting. 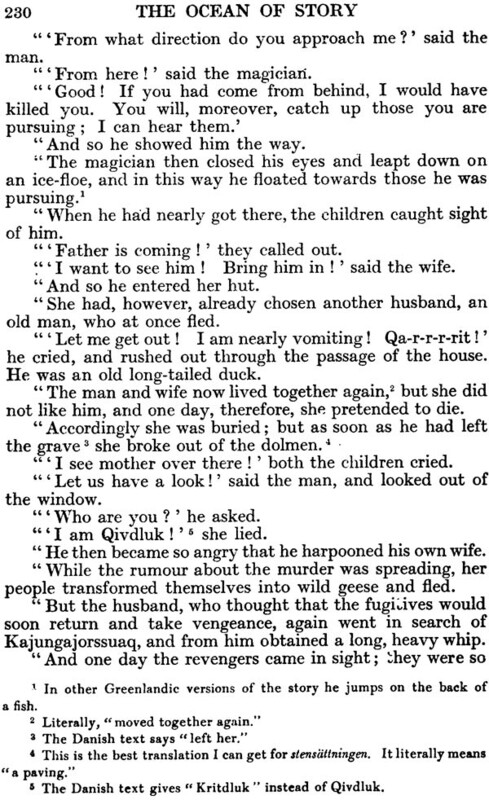 In fact, like the longest tale in the Nights- "King Omar Bin Al-Nu'uman"-it "has its longueurs and at times is longsome enough," dealing at first with somewhat wearisome accounts of how the hero abducted each of his brides and subsequently had to appease their angry and indignant fathers. Even when the actual fighting beings, we have a long drawn-out series of single combats, which are, however, relieved in places by some fine descriptions of battle scenes, reminding us to similar ones in the tale from the Nights mentioned above. There are also occasional passages of a lighter vein, which come as a welcome contrast. 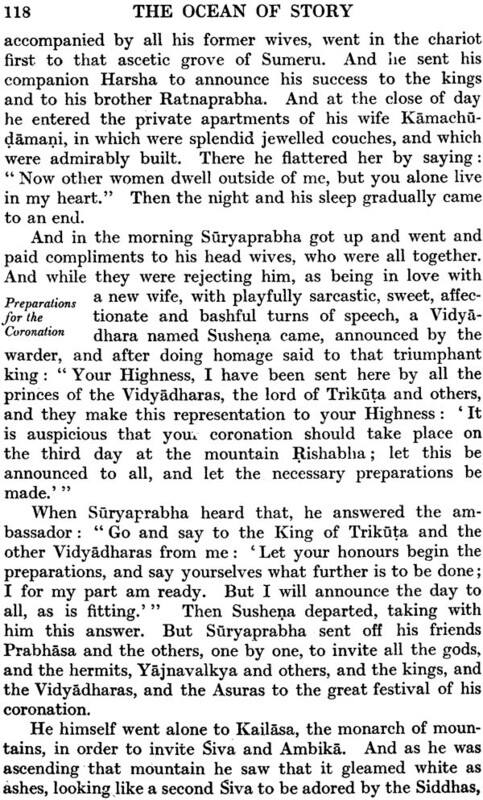 Such, for instance, is this conversation between Suryaprabha'k£vives on a night when their husband is uoo worjied about the slaughter of his men to join them. 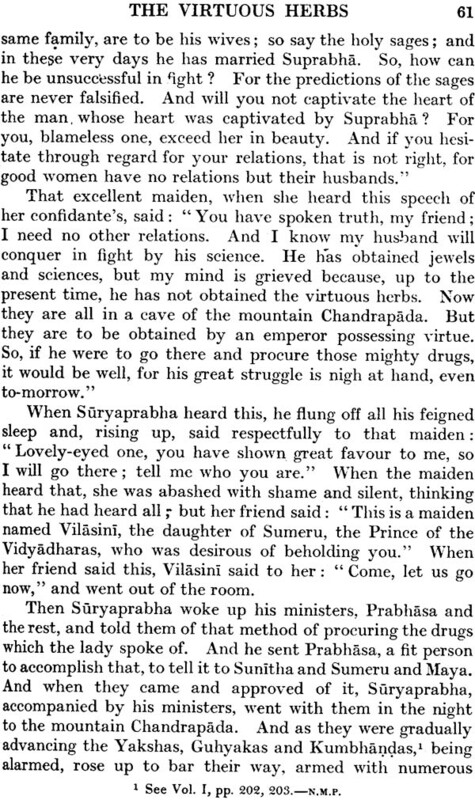 They pjoceed to discuss the various qualities of beautiful women of different lands, for, as Somadeva says (D. text): "
there is no occasion on which women would not talk of the chronique scandaleuse of their town" (see pp. 73, 74). The only sub-story of any length is No. 62D, "King Mahasena and his Virtuous Minister Gunasarman," which introduces the "Quintessence" and "Scorned Love of Women" motifs. Book IX contains several good stories, such as No. 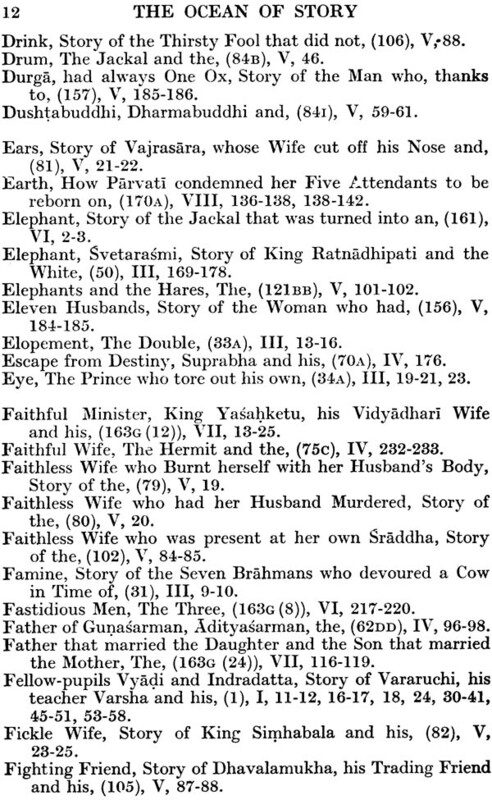 68, "Anangarati and her Four Suitors"; No. 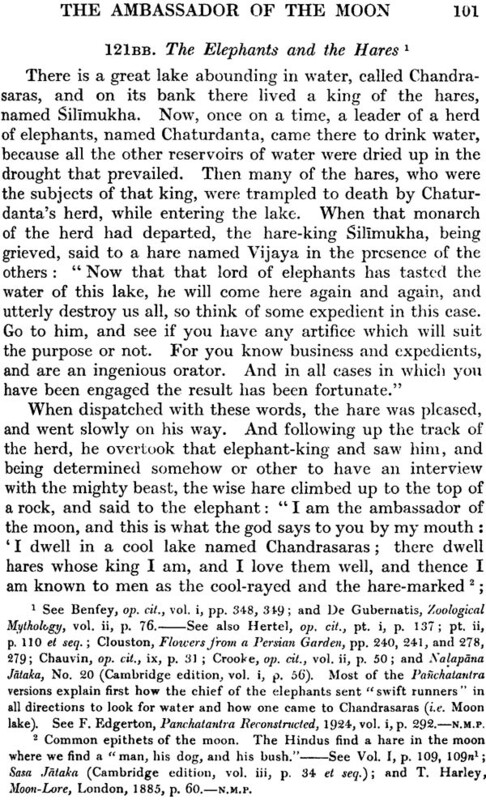 69, "King Lakshadatta and his Dependent Labdhadatta," illustrating the doctrine of karma, or inevitable destiny; and No. 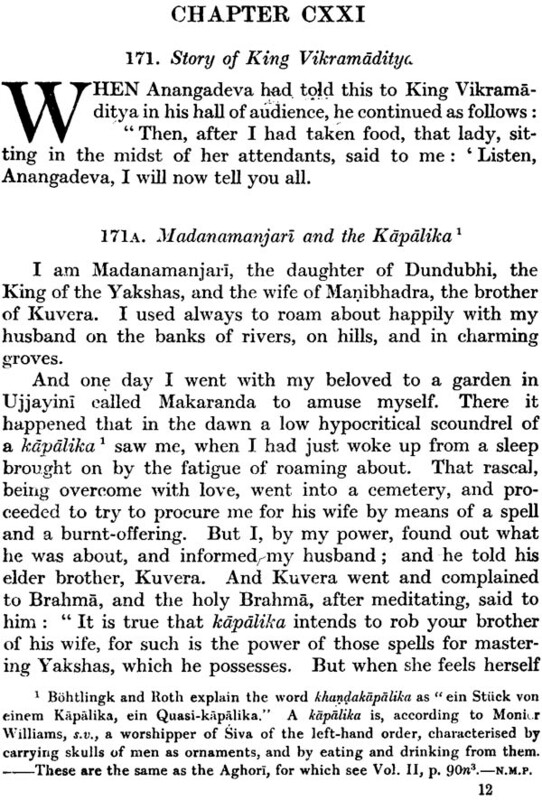 74, "King Kanakavarsha and Madanasundari. 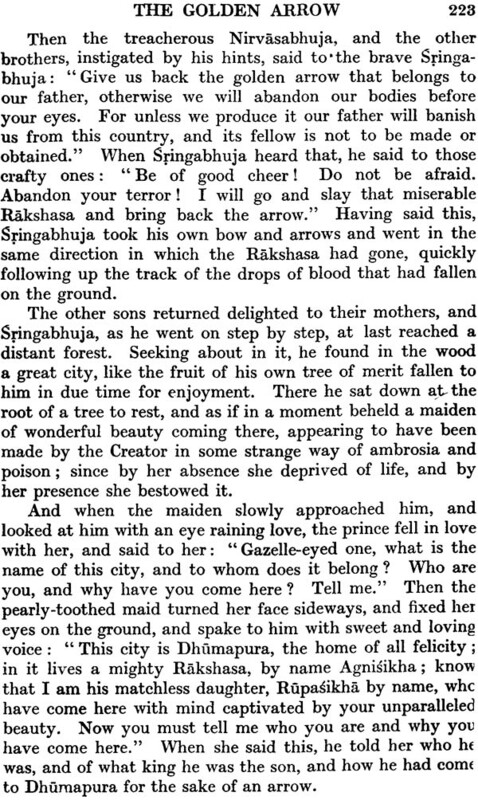 The last tale in the Book, however, is the most important, for it contains one of the best-known stories in India, that of Nala and Damayanti. 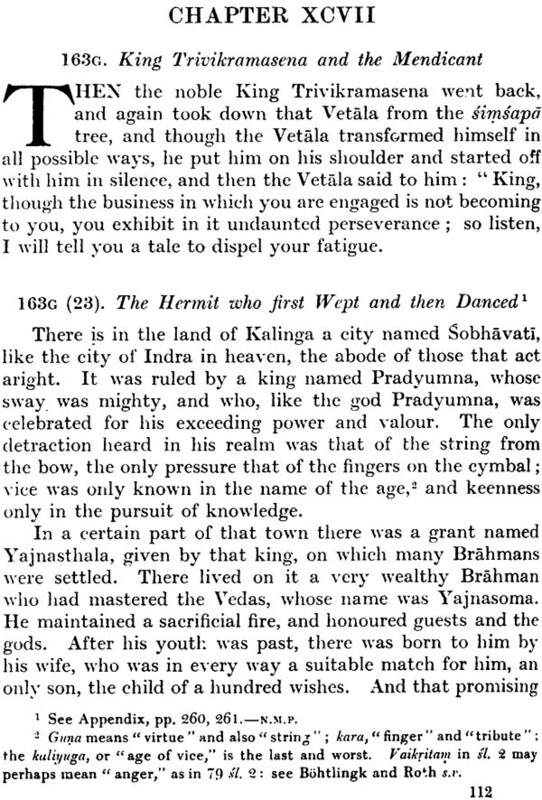 It is taken from the Mahabharata, but has been considerably abbreviated by Somadeva. 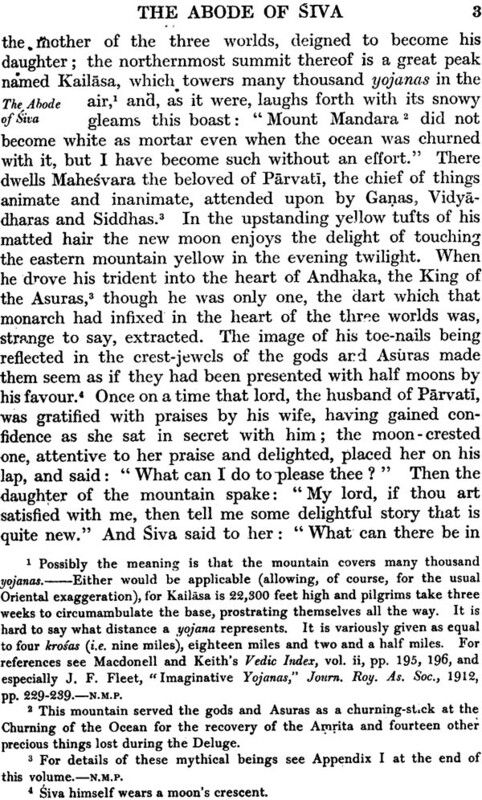 As several of the most beautiful parts have been omitted, I have given them in Appendix II, using H. H. Milman's translation. 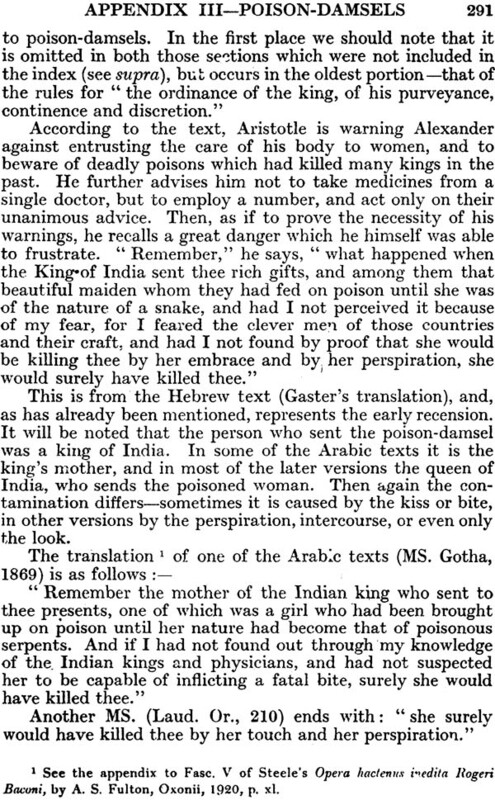 It is a matter of much gratification that Dr Thomas so kindly consented to write the Foreword to the present volume; for, apart from the advantages derives from the pen of so ripe a scholar, there is a further interest in the fact that Dr Thomas succeeded Mr. Tawney as Librarian at the India Office. Once again I have to thank Dr Barnett for his continued proof-reading and constant advice on numerous points. Both Mr. Fenton and Mr. Mashall have been through the proofs from the general point of view, so that mistakes should now be reduced to a minimum. The importance of this volume will be realized after the most cursory glance. In the first place, it contains one of the world's most famous and loved books, the Panchatantra, or Fables of Pilpay. 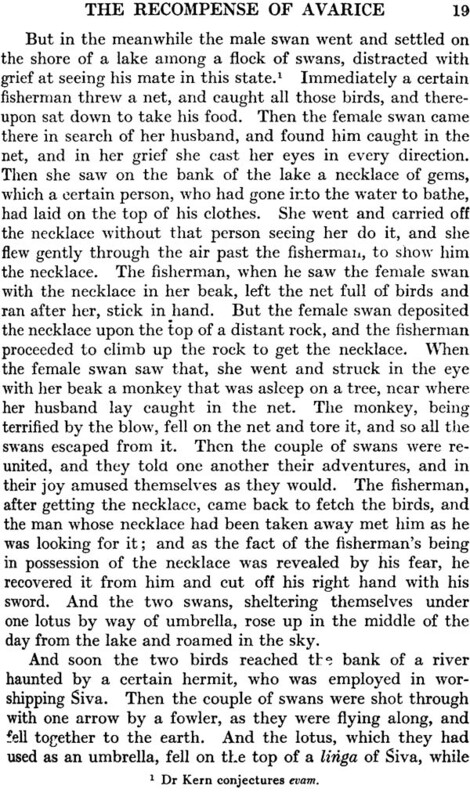 Secondly, the co-operation of Professor Franklin Edgerton, of the University of Pennsylvania, has enabled me to include the most elaborate and comprehensive genealogical table of Panchatantra tradition ever attempted. 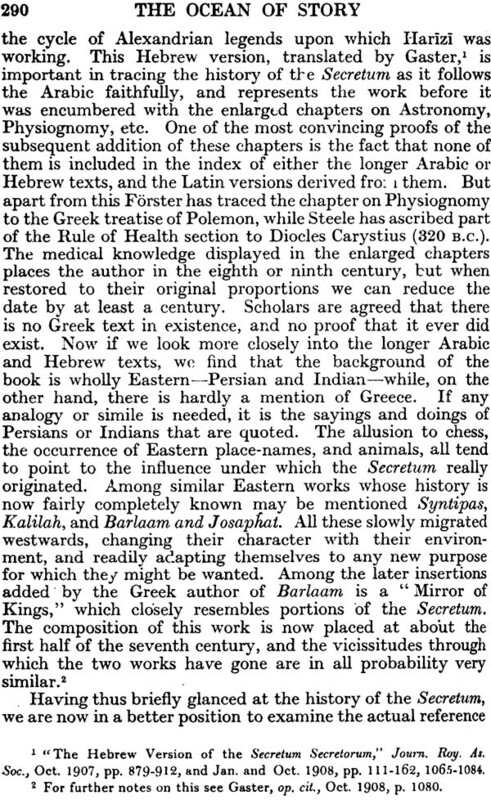 Thirdly, Sir Denison Ross has contributed a foreword containing the results of his original research into the Persian and Arabic recensions of the Fables. His attempt to discredit the Burzoe legend, and consequently to doubt the existence of a Pahlavi version, will cause something of an emeute among Orientalists, who for generations have been perfectly content to march in complaisant acquiescence under the standard of Benfey, Noldeke, etc. Before this volume appears Sir Denison Ross will have stated his case publicly at the Royal Society of Arts; and I await, with no little interest, the dicta of the Learned. 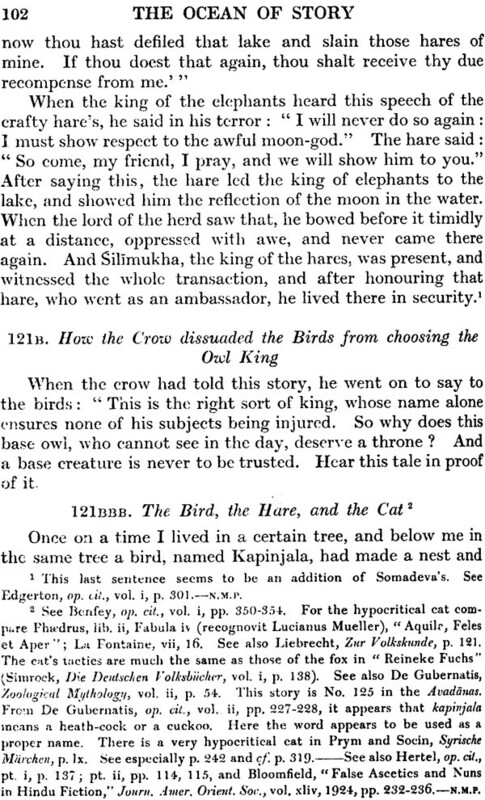 Apart from the Panchatantra, the present volume contains the "The of Ghata and Karpara," which I take to be a version of Herodotus' "Tale of Rhampsinitus." 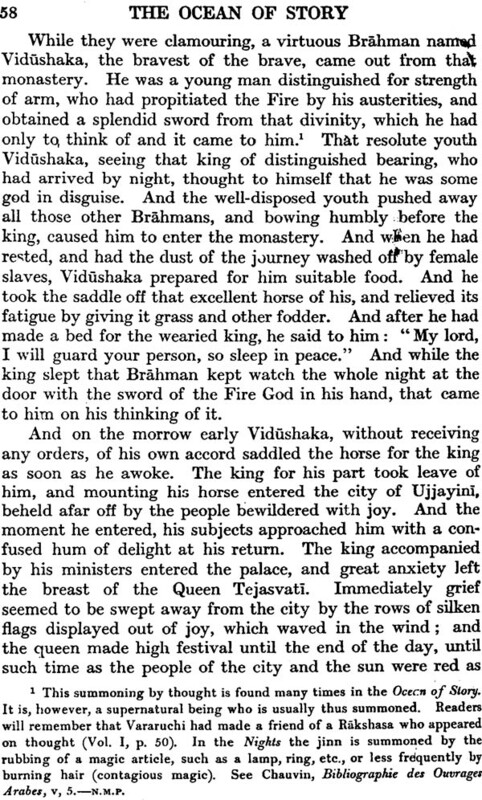 In Appendix II an attempt has been made to show that this tale can boast of an uninterrupted history of over 2300 years! Once again I find myself heavily in the debt of Dr. L. D. Barnett and Mr. Fenton for their continued help, both in proof-reading and in general advice on innumerable points. So far each volume has contained two or three Appendixes, but in both this and the next volume there will be only one. This is due to the subject-matter which they contain. 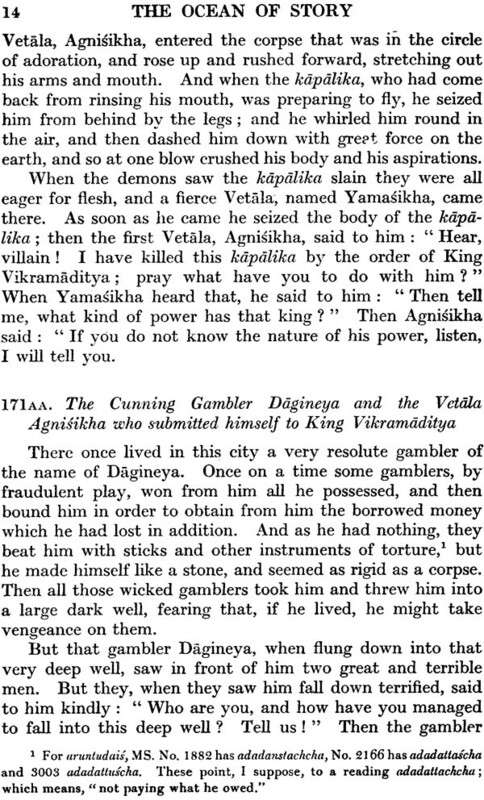 I refer to that most interesting cycle of vampire stories known as the Vetalapanchavimsati. Eight of them occur in the present volume, while the remaining sixteen (really fifteen) will appear in Volume VII. With but few exceptions all the tales are important and worthy of fairly extensive notes. This would mean over-crowding of footnotes or "end of chapter" notes. The history of the collection itself, as well as the frame-story, both require considerable attention. Thus I have decided on the course intimated above. Once again I have been fortunate in obtaining the valuable services of an expert in the writing of the Foreword - Mr. A. R. Wright, President of the Folk-Lore Society. 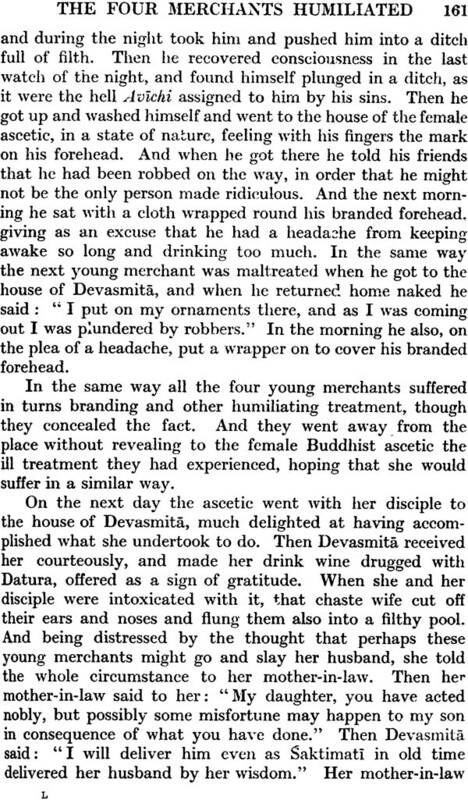 His treatment of the subject is interesting, as it approaches the Indian tales from the standpoint of the European folklorist rather than the Oriental scholar. Both Dr. Barnett and Mr. Fenton continue to render me invaluable service, both by proof-reading and expert advice. As stated in the Preface to Volume VI, there is only one Appendix to the present volume. I consists of notes on the remaining seventeen (really sixteen) vampire stories. 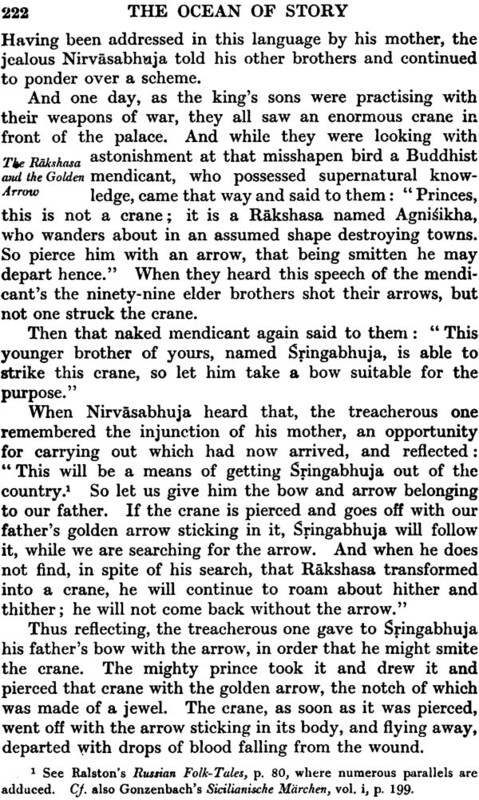 The collection, as given by Somadeva, is obviously in the form in which he found it, and it has been presente din its entirety, despite the fact that several of the tales had already appeared; and others we shall meet again later. So far from being superfluous, I consider this repetition is both interesting and valuable. 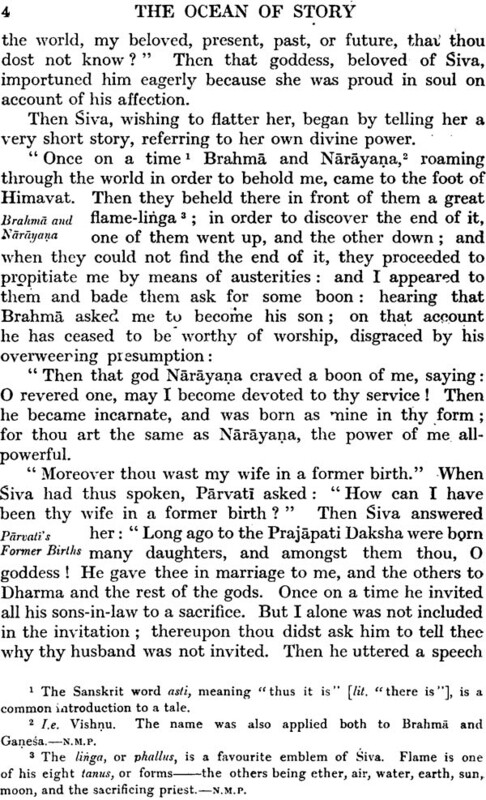 It shows what was probably the form of the story in the original Brihat-katha, and the form it had after it had found its way into other collections. The Foreword to the present volume is of the greatest importance, as it represents a definite step in the study of Fiction motifs. 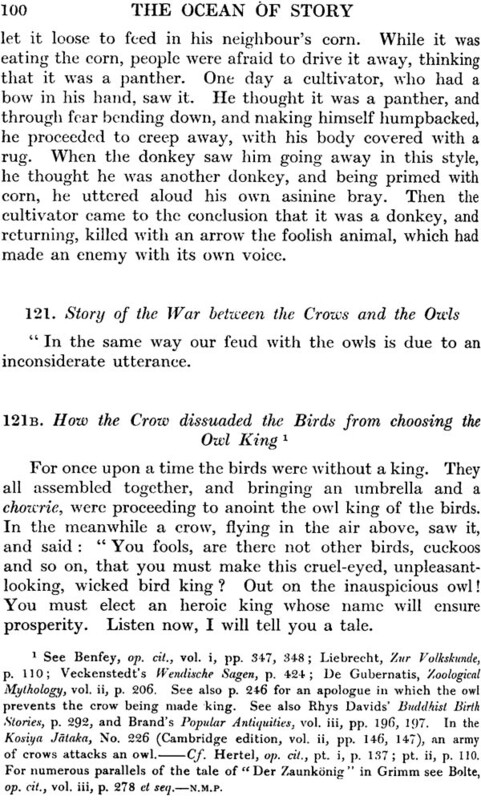 Although the tabulating and explaining of "incidents" in folk-tales was begun in 1884 by Sir Richard Teple in Wide-Awake Stories, folklorists seem to have made but little headway. Professor Bloomfield, whose work I have quoted soften, now take up the cudgels himself, and has honoured my work by a most original and suggestive Foreword. Dr Barnett and Mr. Fenton still gallantly sail with me on the Ocean, though at times I fear I have taken them on a long voyage; but the terros of the deep seem to leave them unmoved!.